Yesterday started out tough but ended up on a lovely note. There were several decisions to make, hard things to do, and then, after breakfast, I discovered a jagged edge on my bottom front tooth. It had been feeling a little odd for about a month, but I’d ignored it. Upon closer examination, I discovered it was a chipped tooth, with a vertical crack to the gumline. The panic over a big dental mess hit me hard. Thankfully, my wonderful dentist Dr. Weisberg was able to see me yesterday afternoon. After x-rays and an examination, he determined that the “crack” was a typical dental craze line. I did have a chipped tooth, but that was easily repaired. Last night, I was looking at used cars and found one that was very pretty. The stress of making a decision brought a fast return of the upset stomach, and I got fogged in by the angst. I contacted two very dear friends to seek out their advice, and called my daughter. All three responded in seconds, offering sagacious counsel and wise insights. They patiently and lovingly explained that this wasn’t the car (or the deal) for me. Back at home, as I drifted off to sleep, I felt grateful that I had such loving and clear-minded friends, willing to drop everything and help me. When I awakened in the wee hours, unable to sleep, I went to my website and re-read some of the beautiful comments left there by “online friends.” These are people that I’ve never met, and yet they have so much love in their heart that they’re willing to pray for a stranger’s return to health and wholeness. That is a reason for much gratitude. This has become a habit: When I can not sleep, I revisit the “comments” section of my blog, and read each and every one, again and again. These comments mean a lot to me. More than anything, the purpose of today’s post is to thank each and every kind soul that has helped me through the hard days. Every comment here brings me much joy, and assuages the nagging fear that I’m alone. In 2002, this website was launched to share the good news and joy of Sears Homes. Sixteen years later, it has become a place where I am the recipient of countless blessings. Thank you for keeping me here. And thank you for drawing that circle of love and taking me in. PS. If you’d like to buy a slightly used Camry, please leave a comment! 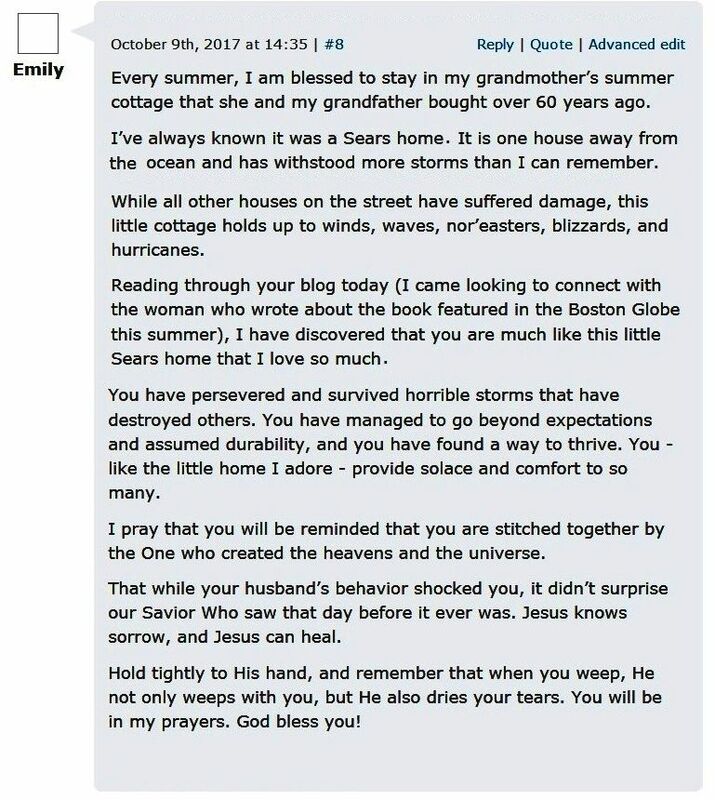 The above is a comment written by Emily about three months ago (at a blog titled "Thank you for your prayers."). "While your husband's behavior shocked you, it'd didn't surprise our Savior..." That line touched my heart. 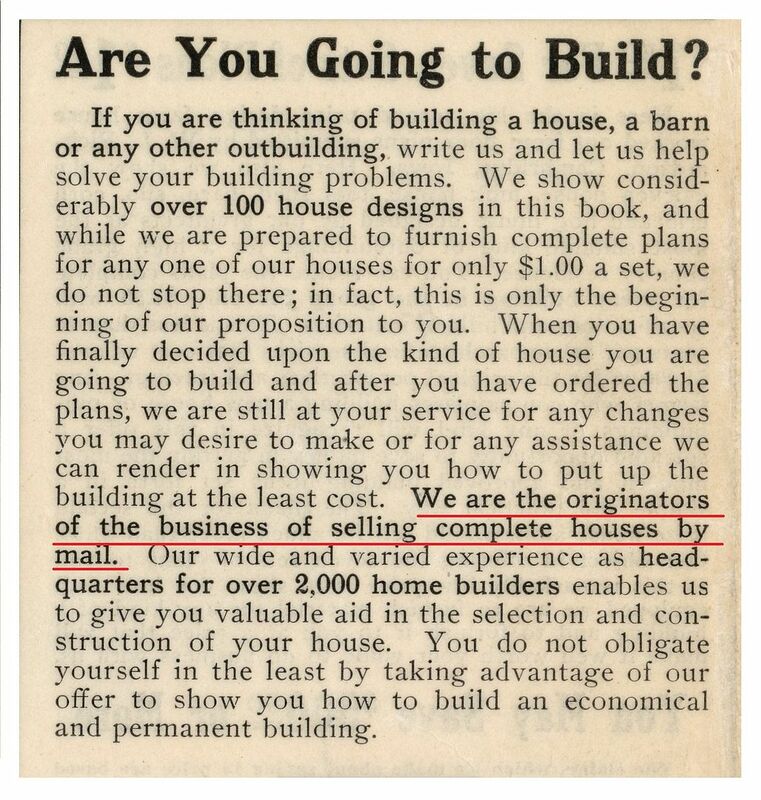 Sears offered "Honor Bilt" and "Standard Bilt." 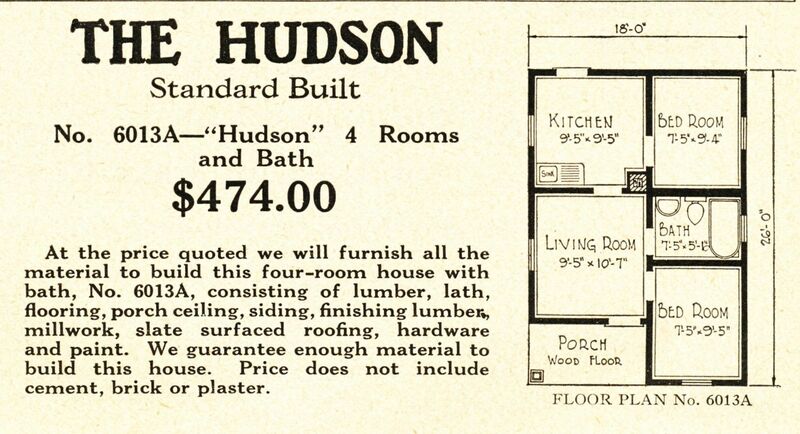 The Hudson was a "Standard Bilt" Sears house. 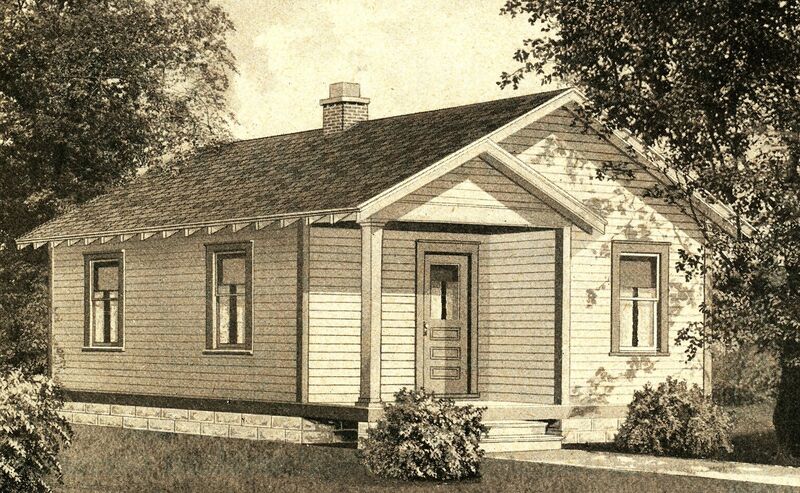 The Standard Bilt houses were never really intended to be permanent houses. They were quite modest. Framing members were spaced at 24" and doors and windows did not have double headers. 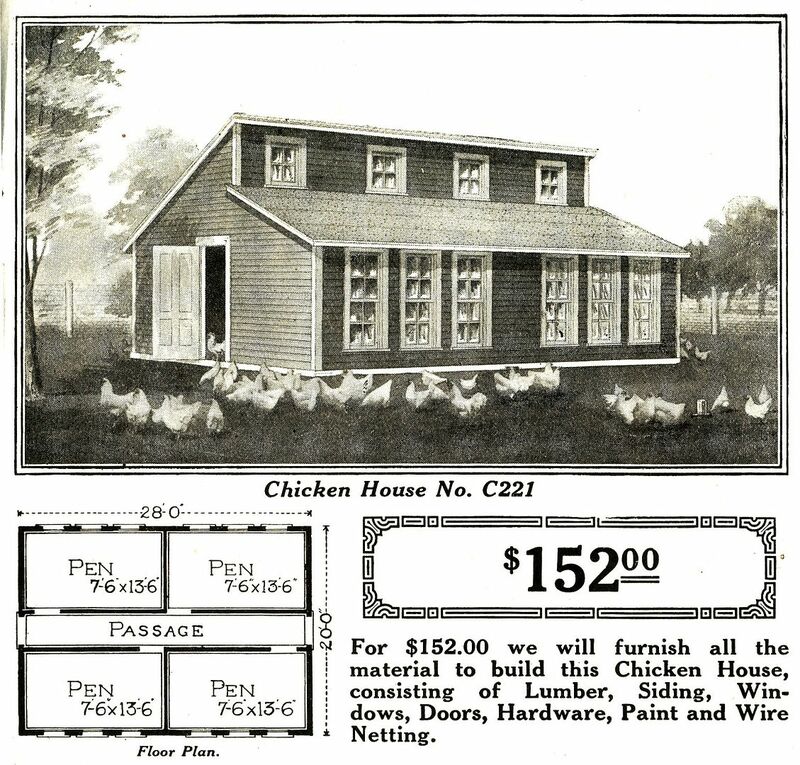 There was no exterior sheathing, bur just the clapboard (1925 catalog). As you can see from this image, it's a simple little house. 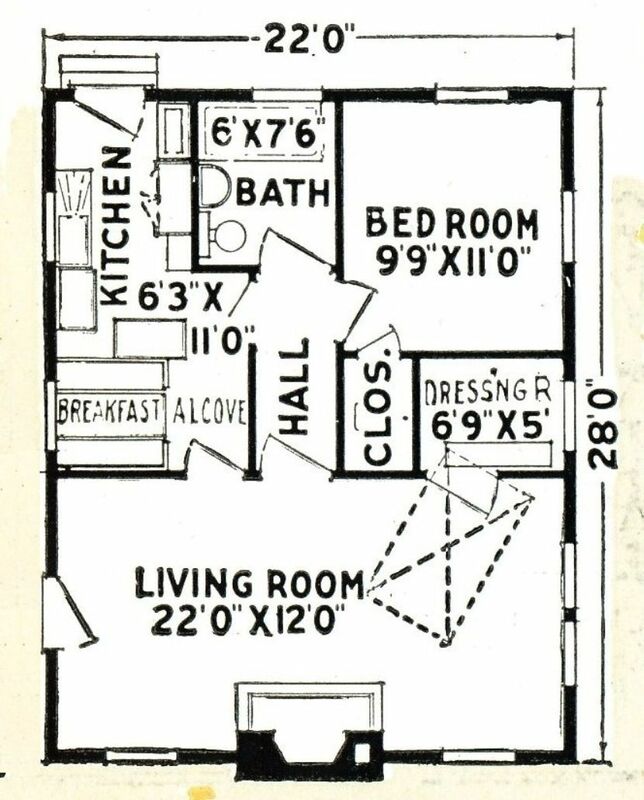 There were two floorplans. 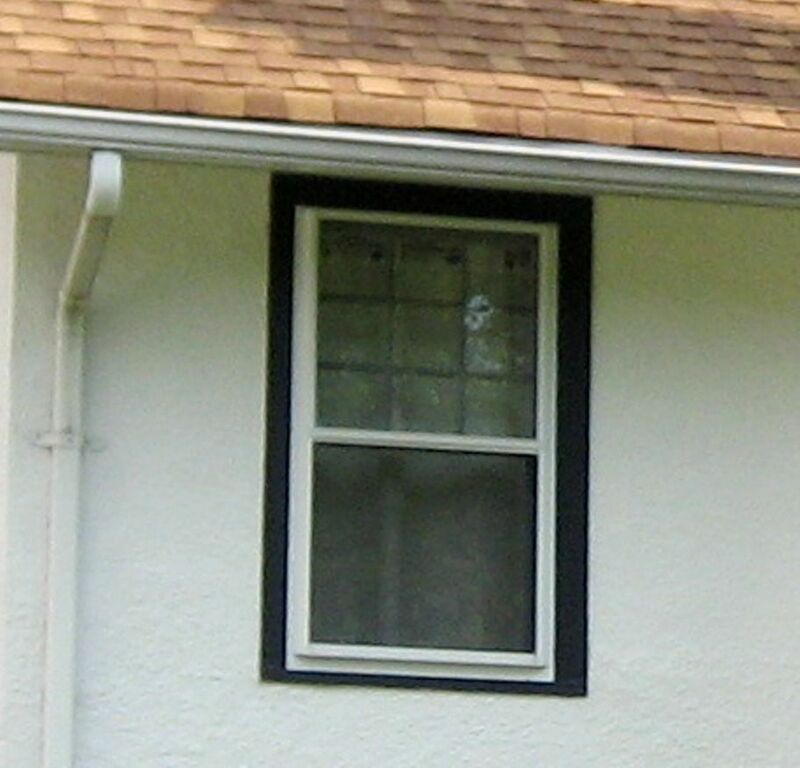 The "bigger" house had the second windows in the living room. 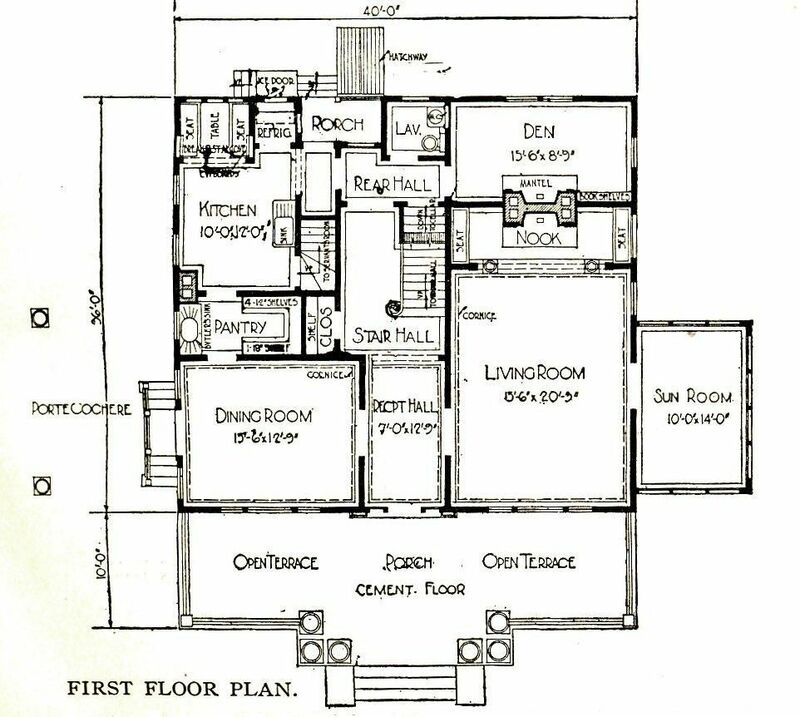 The 2nd floor plan is a wee bit bigger than the first, and it has the double window in the living room. Still, this "larger model" is under 600 square feet. And how in the world do you find a simple little house like this? You sure can't do it by a windshield survey. I found this house via mortgage records. It's a Sears "Hudson." To read the original blog where Emily left her comment, click here. 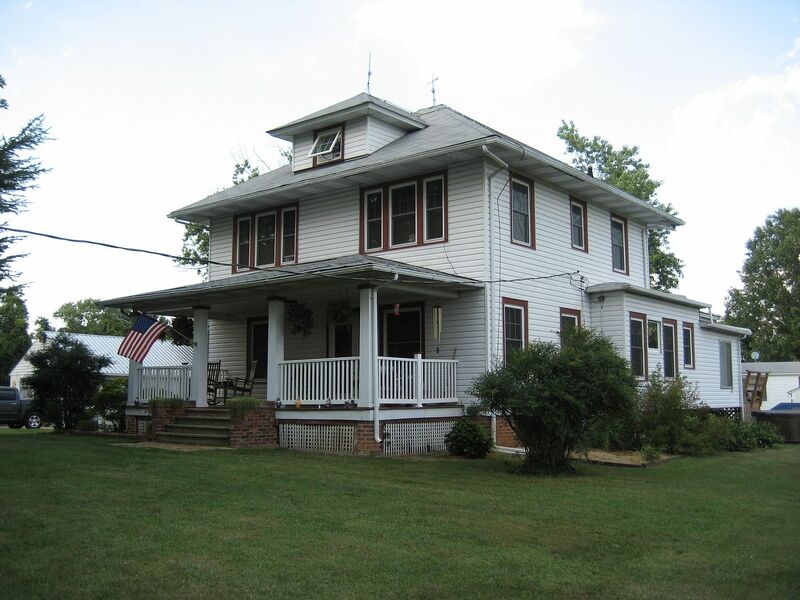 The home of Confederate hero Captain J. M. Cunningham and it’s a Sears Hillrose! Truthfully, I didn’t know about the home’s ties to Civil War history until after we arrived there, and talked with the homes’ owners, Brian and Melody. 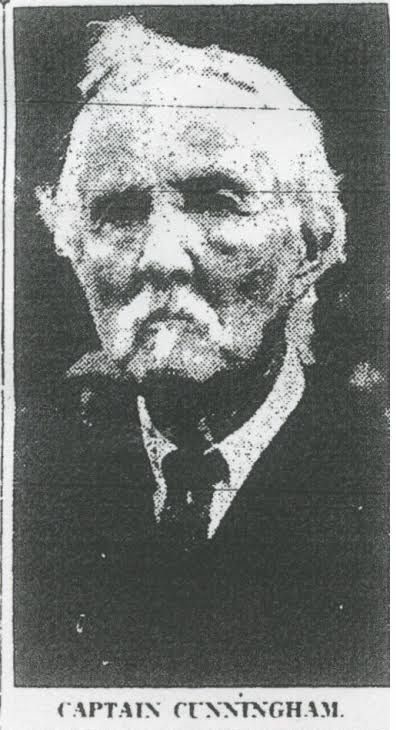 They shared a 75-year-old newspaper article containing the obituary for Captain J. M. Cunningham, and proudly explained that he’d lived in their Hillrose for many years. Brian’s parents purchased it from the Martin family, who’d purchased it from the estate of Captain Cunningham. The greatest obstacle to our advance [at the "Bloody Angle" at the Battle of the Wilderness] was a young artillery officer, standing in the breach, rallying his men so courageously that [I] did not have the heart to order my sharpshooters to pick him off. This young officer was Cunningham. The 22-year-old Captain mustered out of Lee’s Army of Northern Virginia on April 9, 1865 at the Appomattox Court House. When he died in July 1939, he was 96, and the highest ranking surviving field officer of the Confederate Army. That’s the story behind the Hillrose in Brandy Station. Today, Brian and Melody appreciate and understand their unique role as owners and caretakers of this wonderful old kit home. As you’ll see from these photos, the house is lovingly cared for, and the 100-year-old oak and pine trim inside the house retains its original finish, and there are even a handful of original light fixtures scattered throughout. In the kitchen, the hard-rock maple floor is flawless, and down in the basement, Brian has salvaged and preserved other original fixtures from the house, with the hopes of restoring them. Thanks so much to Brian and Melody for allowing me and Wayne to spend a couple hours oohing and ahhing over their grand old home. It was a memorable afternoon and the highlight of our fun trip. To read more about the Hillrose, click here. 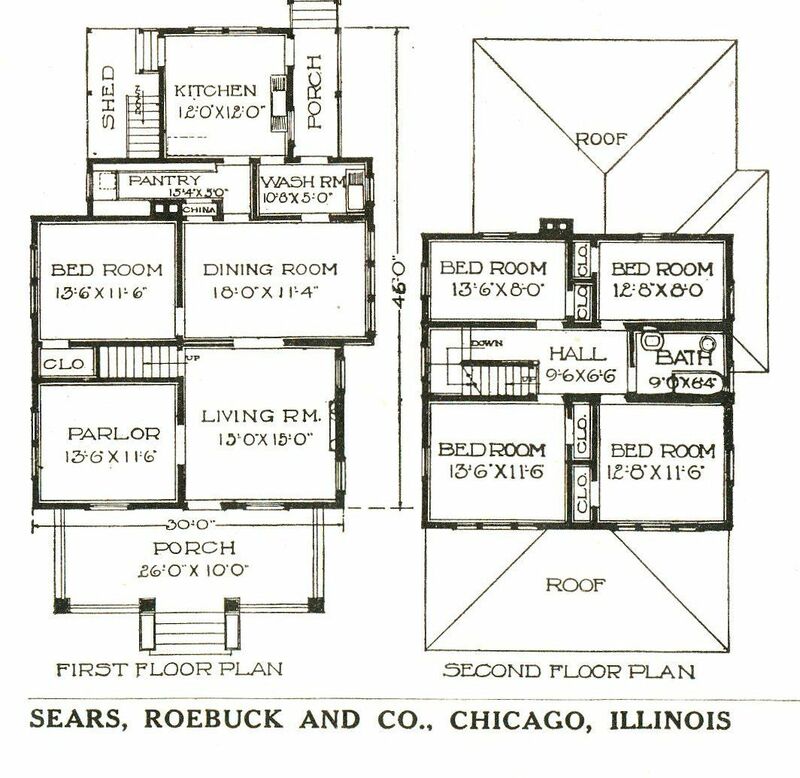 Want to learn more about how to identify a Sears House? Click here. 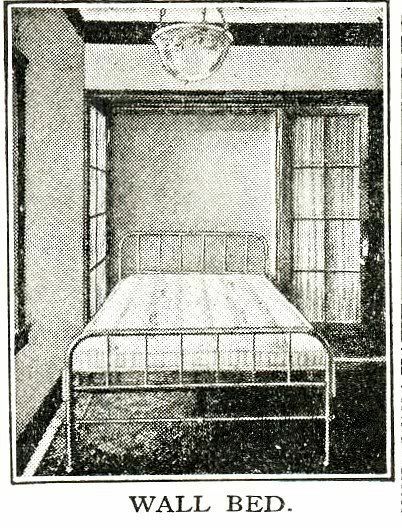 The Hillrose, as seen in the 1916 catalog. 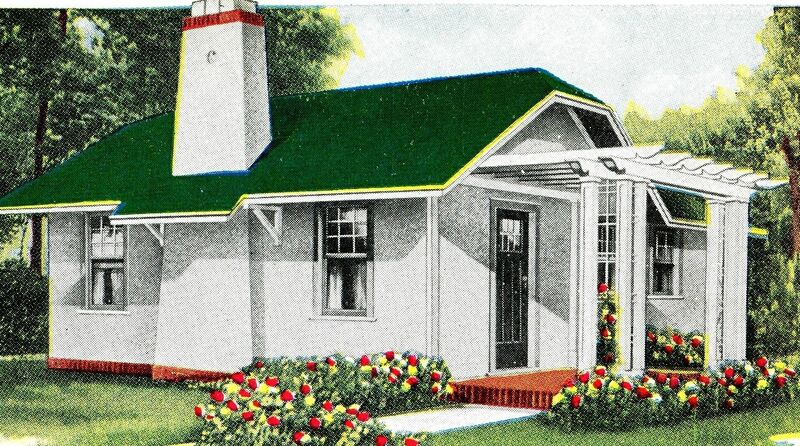 The Hillrose was one of the largest kit homes offered by Sears, with more than 2,200 SFLA. It featured five bedrooms, which could be six (if you counted the parlor). The Hillrose in Brandy Station was the very first Hillrose I'd ever seen. 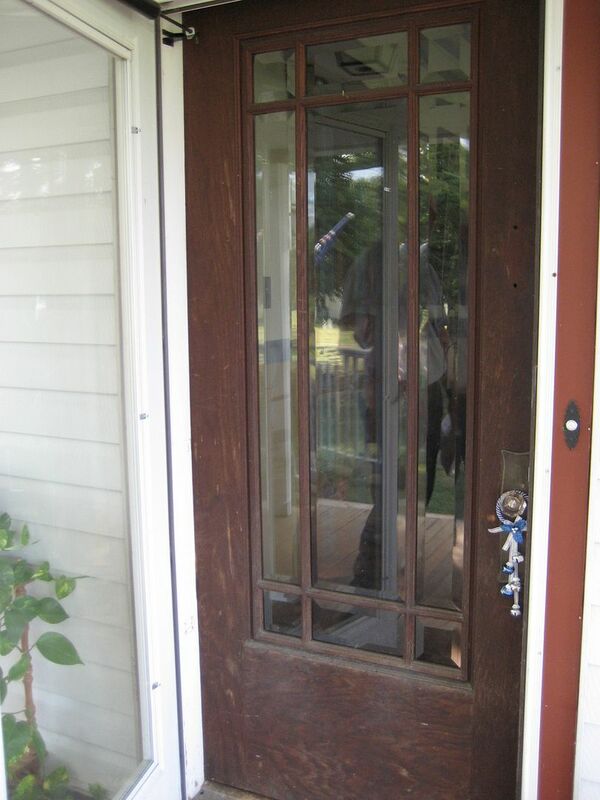 One of its many unique features is this: The front door is not centered. The window arrangement is also unique. Very few foursquares have three windows on the 2nd floor and single windows on the first. 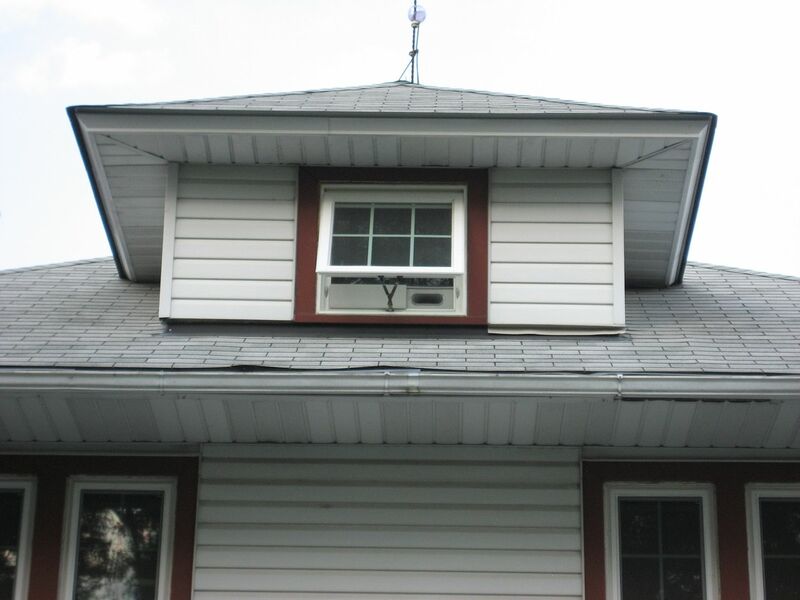 The dormer is another eye-catching feature. That's a mighty small window for such a big dormer. The Hillrose, as designed, has a small closet window on this side (first floor). The Hillrose in Brandy Station was modified to have a full door here. Another interesting feature are the two dormers. These are the only dormers (front and left side) on this house. 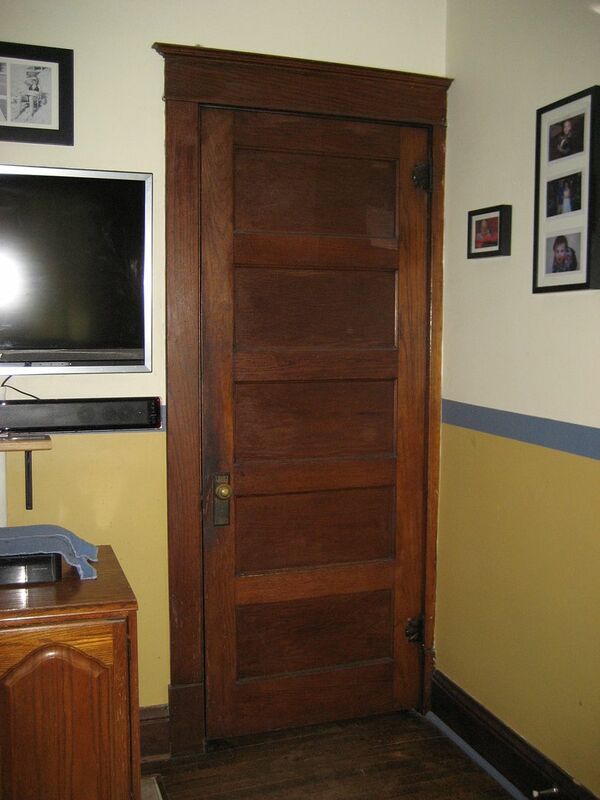 The front door is original. How delightful is that! And the beveled glass is original too! And here's a photo of Captain John Miller Cunningham, the highest ranking surviving field officer of the Confederate Army. He died in 1939 at the age of 96. Photo is courtesy Clark B. Hall. 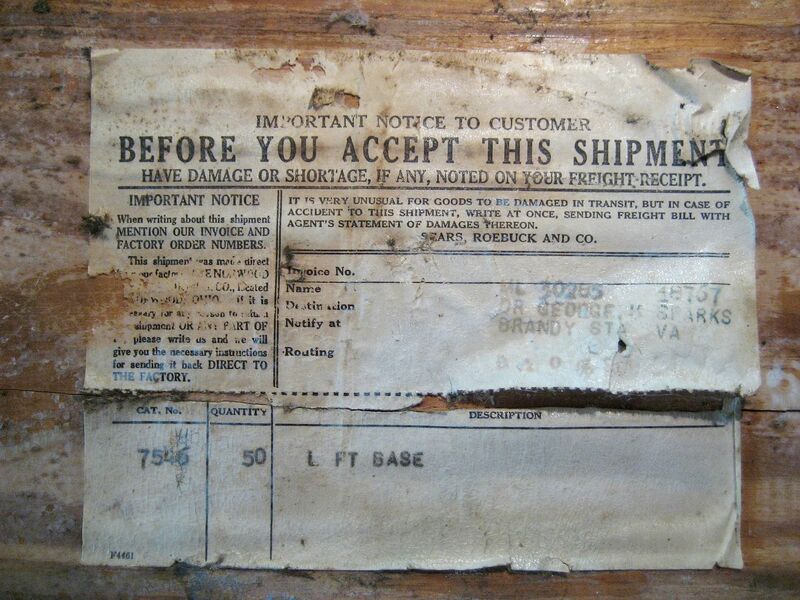 Brian, the home's owner, found a shipping label on the back of some millwork. The home's purchaser and builder was Dr. George M. Sparks. According to the 1920 Census. Dr. Sparks was a 50-year-old man with a 30-year-old wife (Daisy) and three children, 12, 10 and 2. Busy fellow, that Dr. Sparks. Seems that George married Daisy in 1905. In other words, in 1905, the 35-year-old doctor married a 15-year-old girl. Yowza. 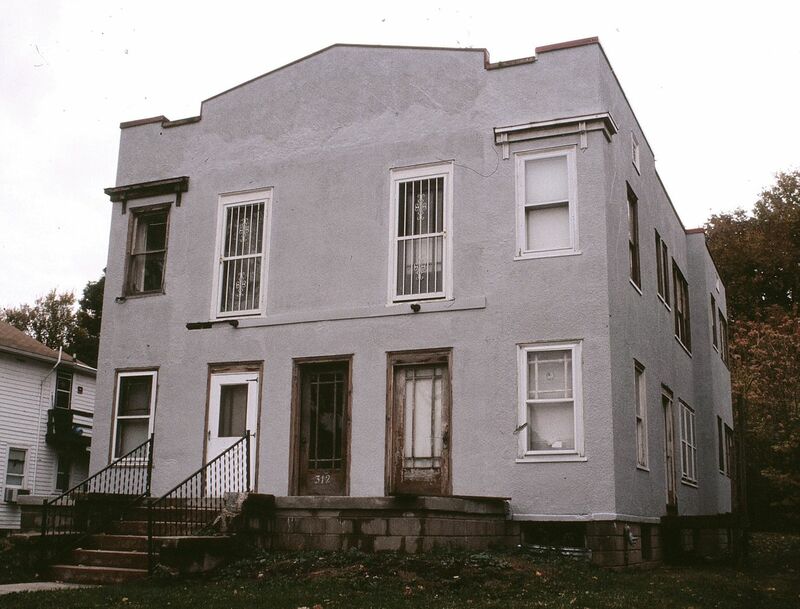 He died in 1925, and by 1930, Daisy was renting a home (with her three children) in Washington, D.C.
As mentioned, much of the trim in this century-old house retains its original finish. 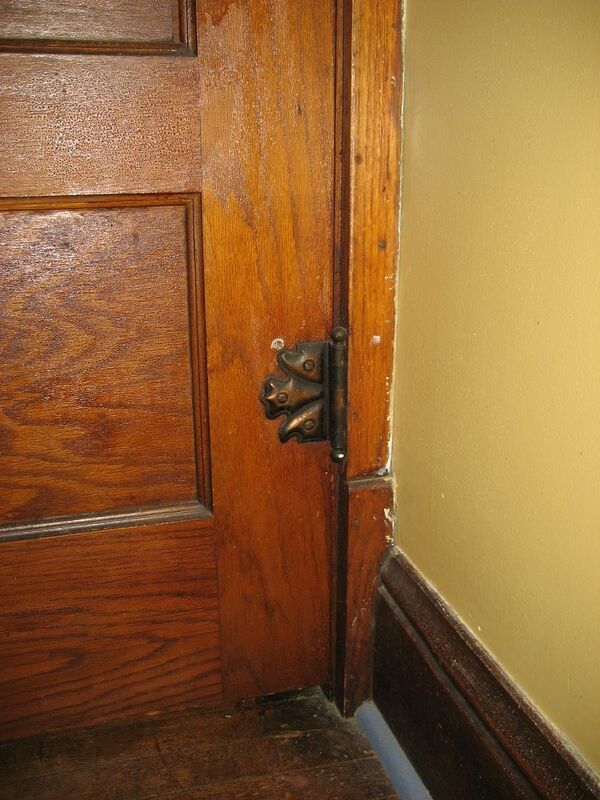 And what would a Sears House be without those classic Sears hinges? 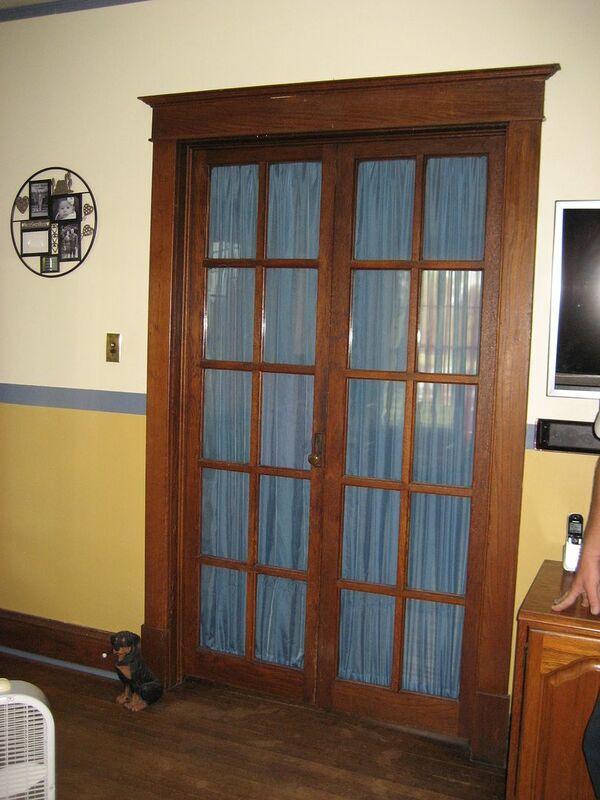 The French Doors that separate the living room from the parlor also retain their original finish. 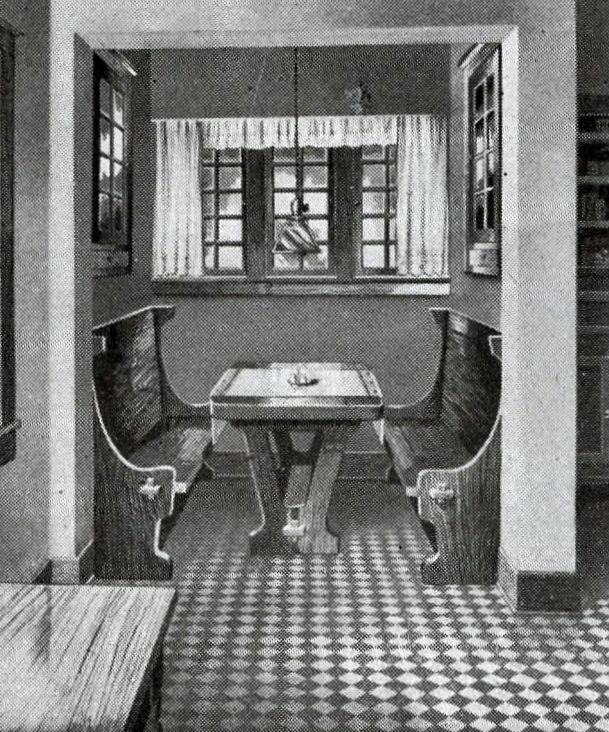 A built-in buffet, as per the home's original plans. 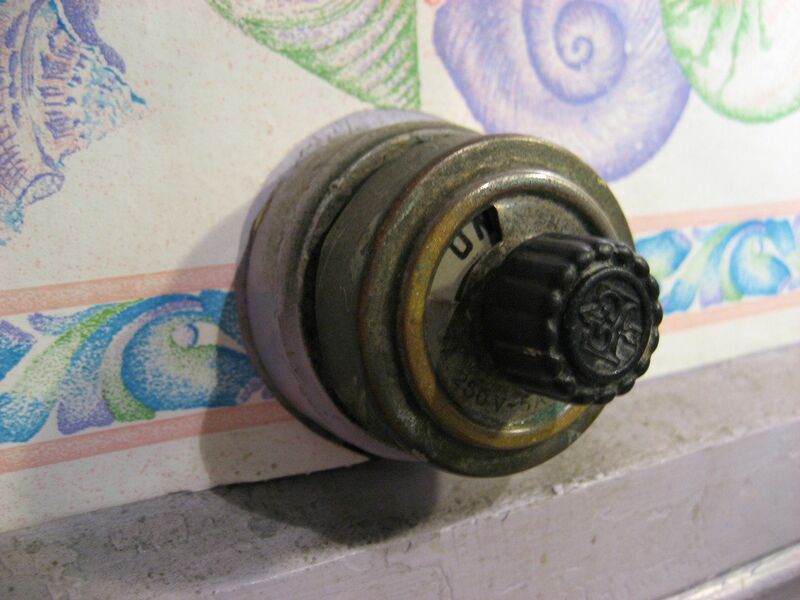 And even a vintage electrical switch. 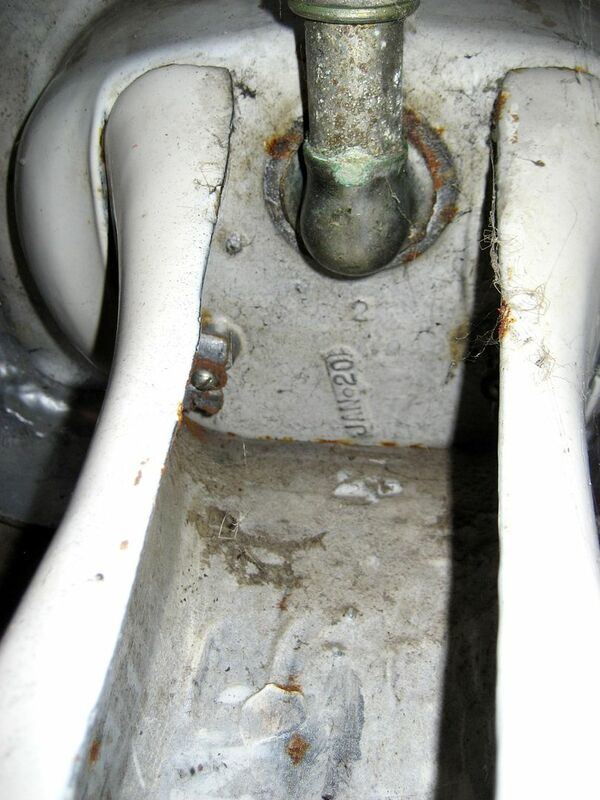 One way to "date" an old house is to look under plumbing fixtures. This old pedestal sink (now relegated to the Hillrose's basement) has a casting date of January 1920, telling us that the house was built after January 1920. God bless these wonderful homeowners. 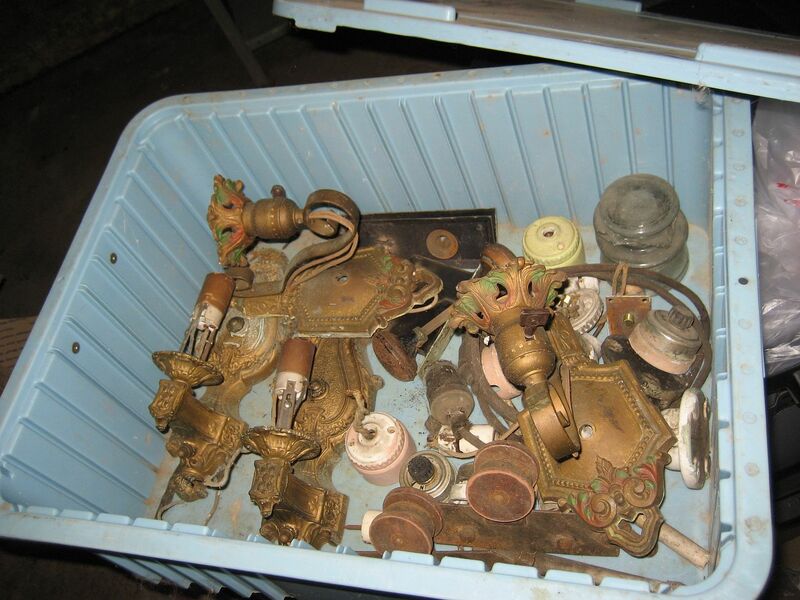 They've saved every piece and part that they've removed from the house, with the high goal of restoring these old fixtures and re-installing them. 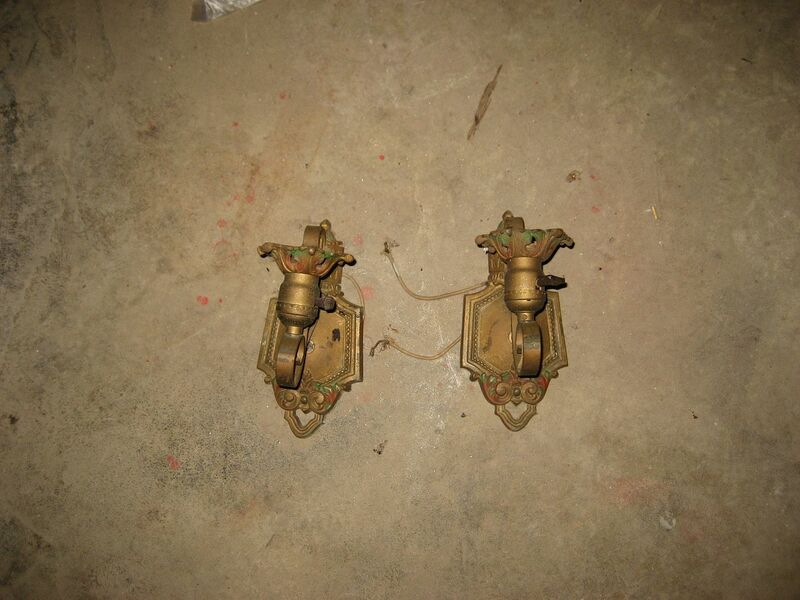 Hopefully these sconces will one day grace the dining room walls again. The Hillrose staircase is in an unusual spot: Behind a door. It's also quite steep for a house of this size and vintage. 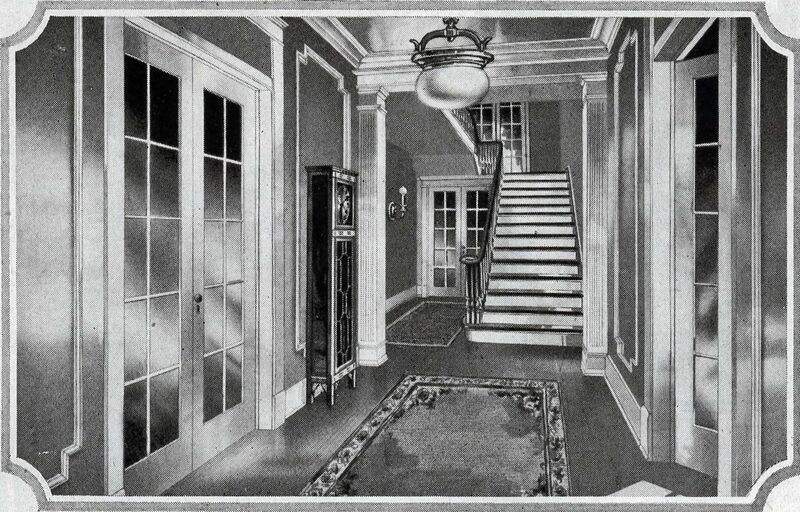 Close-up of the floorplan shows that staircase. 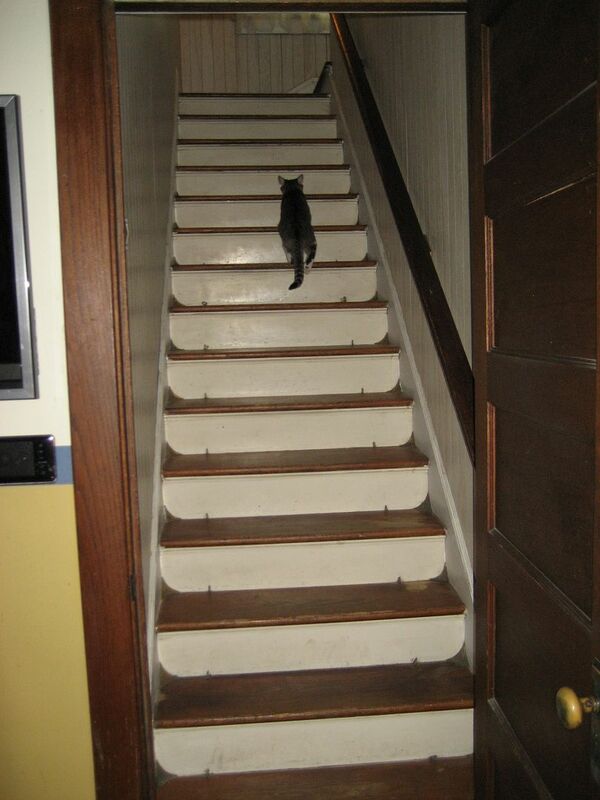 And note the placement of that closet behind the stairs. A little piece of that 2nd floor closet window remains on this Hillrose. 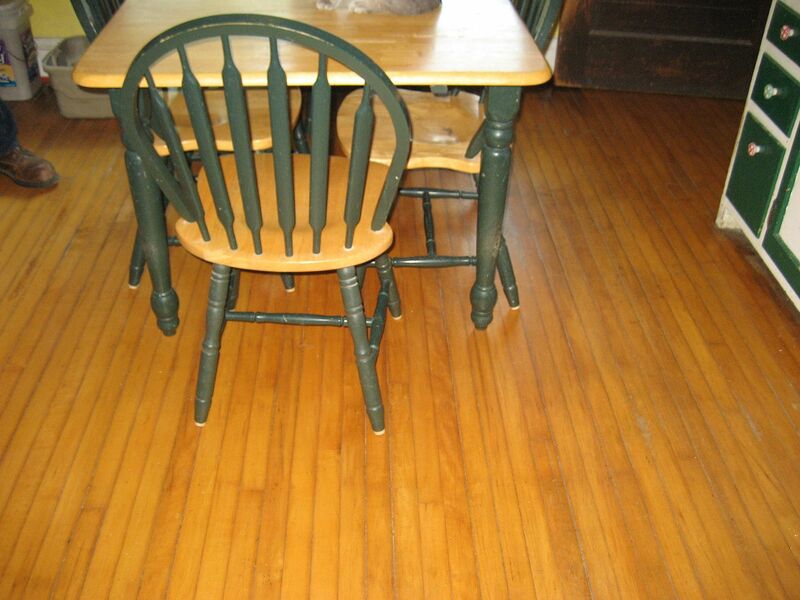 In a Sears kit home, the floors in the kitchen and bath are typically hard maple. The original intention was that linoleum or some other traditional moisture-resistant floor covering be used. 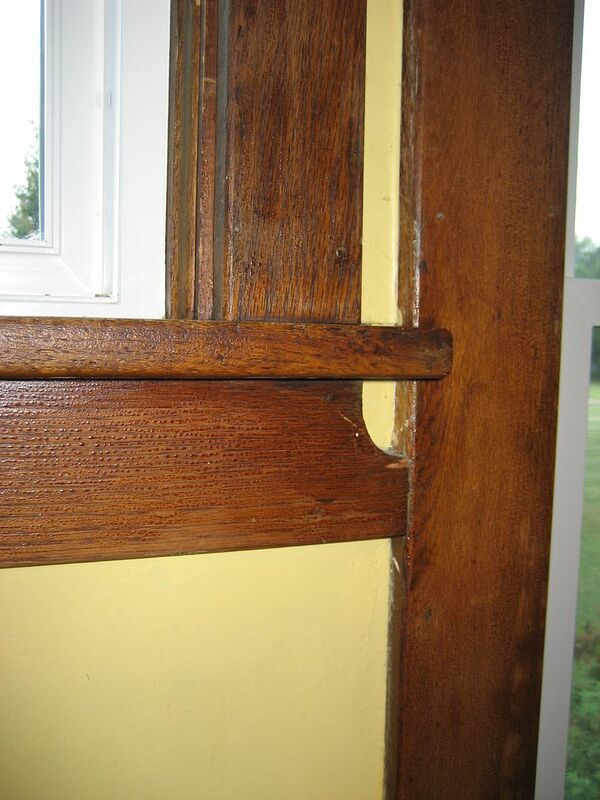 I've been in countless Sears kit homes where the homeowner removed layers of old flooring to expose the original maple. Beautiful, aren't they? And this is what that large bay window looks like inside. I love this intricate detail on the wood trim. 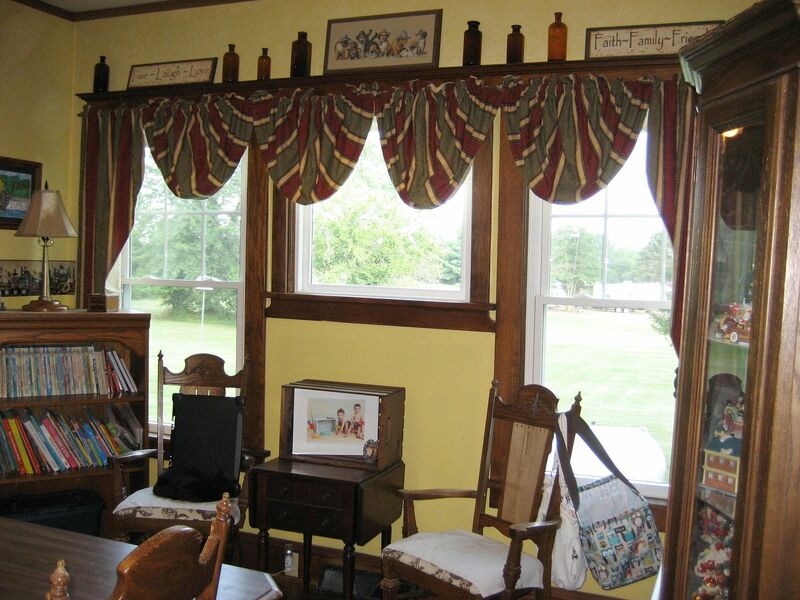 Another view of that spacious bay window. Didn't I promise you that it was a grand and glorious home? Hmmm…Whom Do We Know in Ohio? Preferably near Convoy, Ohio (or Dixon, Indiana) and specifically at 12716 S. State Line Road. This is the site of yet another Sears Hillrose, which Rachel Shoemaker found with a little detective work. Turns out that State Line Road is so named because it marks the boundary between Indiana and Ohio. Thanks to Rachel, we have a picture of the Hillrose on State Line Road, but it’s from the assessor’s website and it has its limitations. Nonetheless, a crummy picture is incomparably better than no picture, so I’m very grateful that Rachel was able to find this image. The reason I’m so enchanted by this house is that it appears to have its original siding, windows and porch - three big pluses. To read more about the Hillrose in prior blogs, click here or here or here. 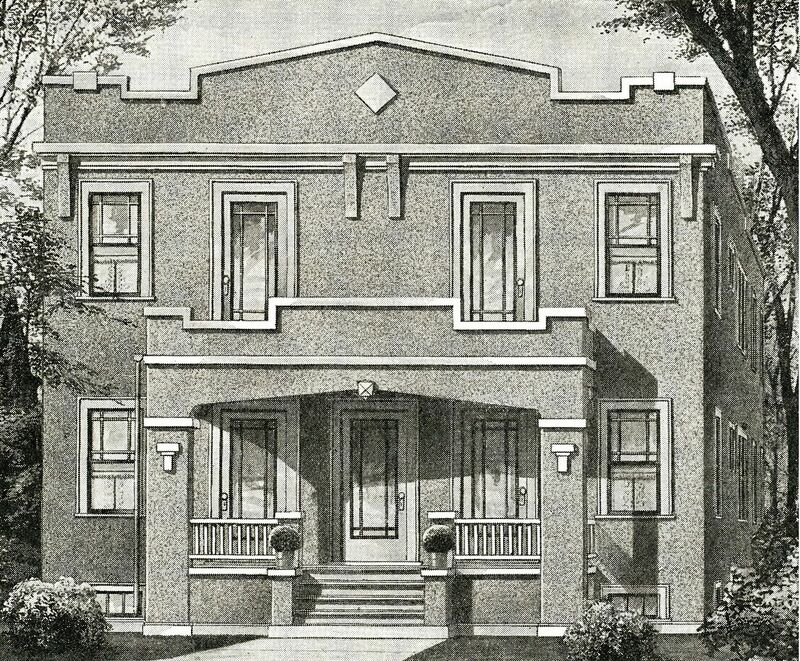 The Hillrose as seen in the 1916 Sears Modern Homes catalog. What a beauty! An interesting note: The front door on this house is not centered. That, with about a dozen other unusual features, makes this house easy to identify. This Hillrose was built about 15 years ago (2000) in West Lafayette, Indiana. It's a modern recreation of an old classic, and has a few embellishments and upgrades. Last August, the owners of this glorious Hillrose invited me to come see their home. 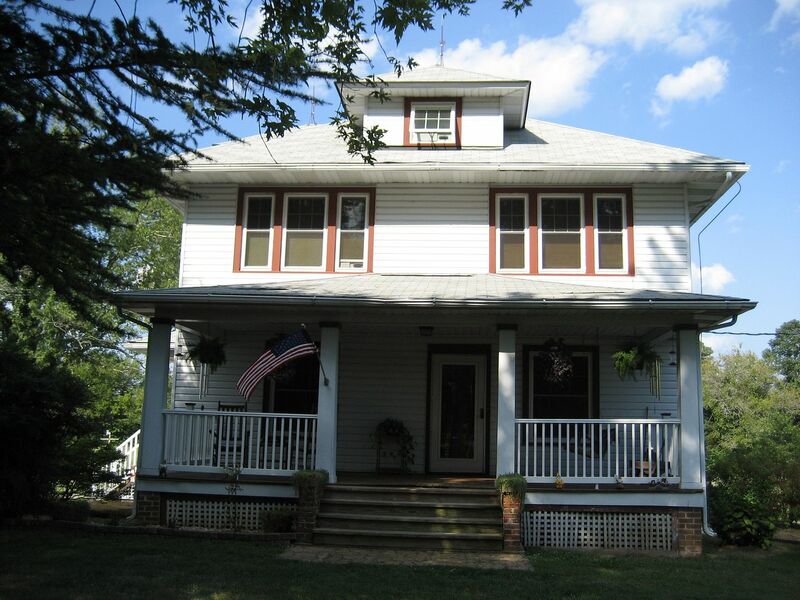 It's in Brandy Station, Virginia (about three hours northwest of Norfolk, VA) and it's in wonderful condition. Carrie Milam found this old Hillrose in Griffith, Indiana. Sadly, the front porch is MIA. Photo is copyright 2015 Greg Decker and may not be used or reproduced without written permission. And here's our sweet little Hillrose in Dixon, Ohio. Many thanks to Rachel for finding this photo at the city assessor's website. The Hillrose retains its original windows, siding and porch, which just makes me swoon. Perhaps best of all, that tiny closet window (2nd floor) is still in place! My kingdom for a few dozen photos of this treasure! Ruh Roh. 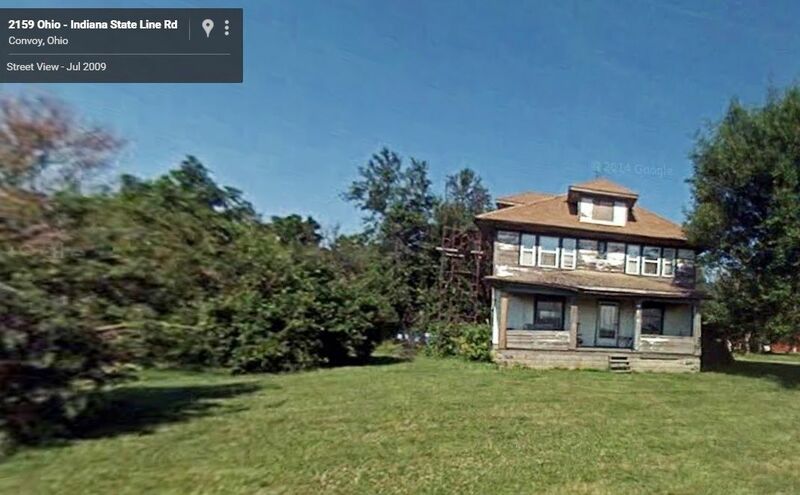 Street view shows this house isn't feeling too well. Google shows it as Convoy, Ohio. I'm starting to wonder if this sweet thing is still among the living. Visit Rachel’s fascinating blog here. Read more about the $1,000,000 Hillrose (built about 15 years ago in West Lafayette, IN) here. In the last few days, I seem to have crossed the Rubicon with search engines, and am now consistently getting 1,500+ hits per day, and sometimes more than 2,000. That’s certainly happy news, as I’ve been faithfully blogging for five years and it is a major time sink. Thus far, I have written 942 blogs here, each heavy laden with photos. 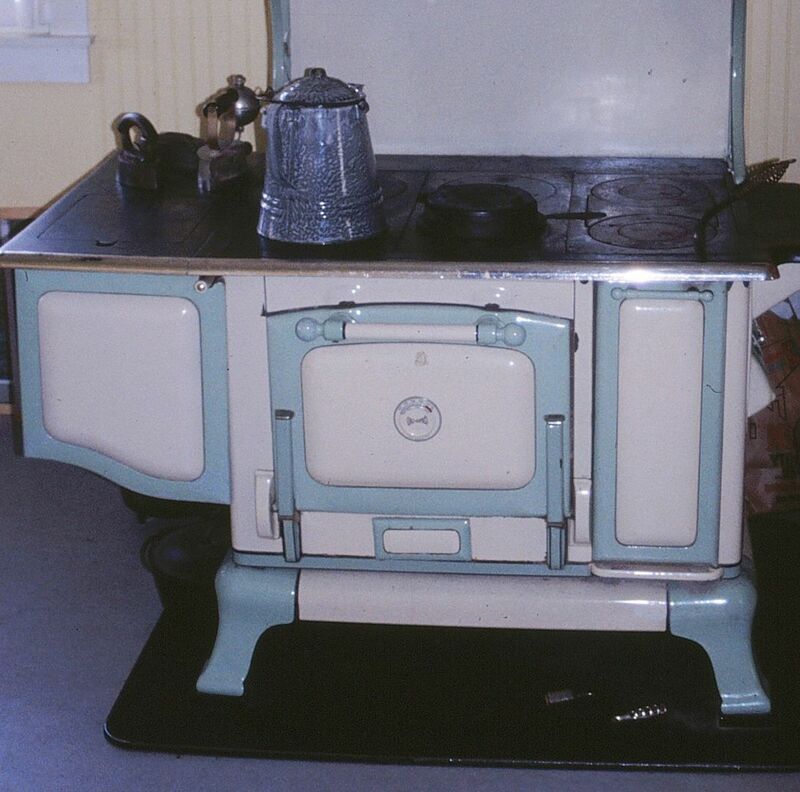 Ever since August, I’ve been wanting to do a blog on one of my favorite finds: A Sears Hillrose in Brandy Station, Virginia but I knew that this would be a time-intensive blog (requiring 4-5 hours to complete). With the holiday season, there is no time, so I thought it was time to do a truncated version of that time-intensive blog. We’ll just call this a preview! Brandy Station is also the site of a famous Civil War campaign. Learn more about that here. This Hillrose was owned for many years by J. M. Cunningham, a famous Confederate war hero. The Hillrose has long been one of my favorites - and apparently is several people's favorites! It won a design prize (sponsored by Sears) in 1914. 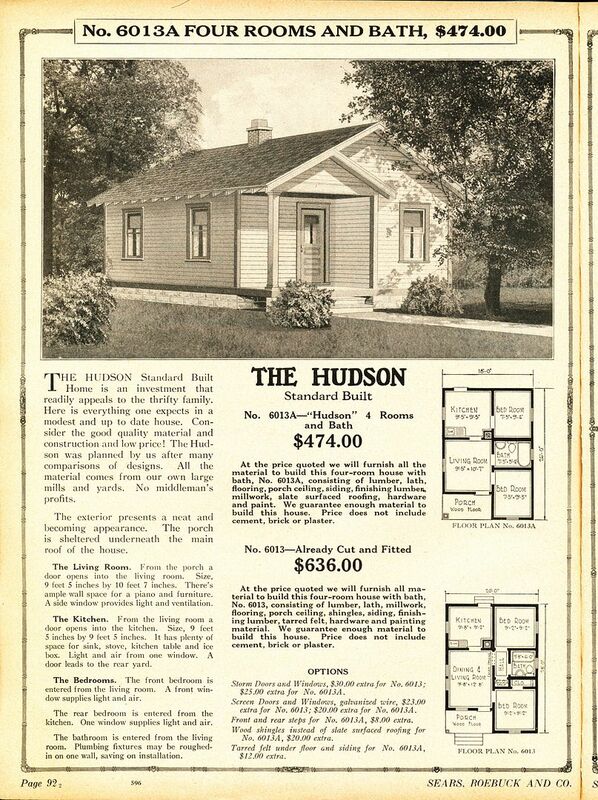 According to this image from the 1916 Sears Modern Homes catalog, there are also Hillroses built at Griffith Indiana, Alvado Ohio, Stratford Iowa, Waterman Illinois and Houghton New York. Four bedrooms and good layout. While it's true that I love them all, the Hillrose is a favorite. 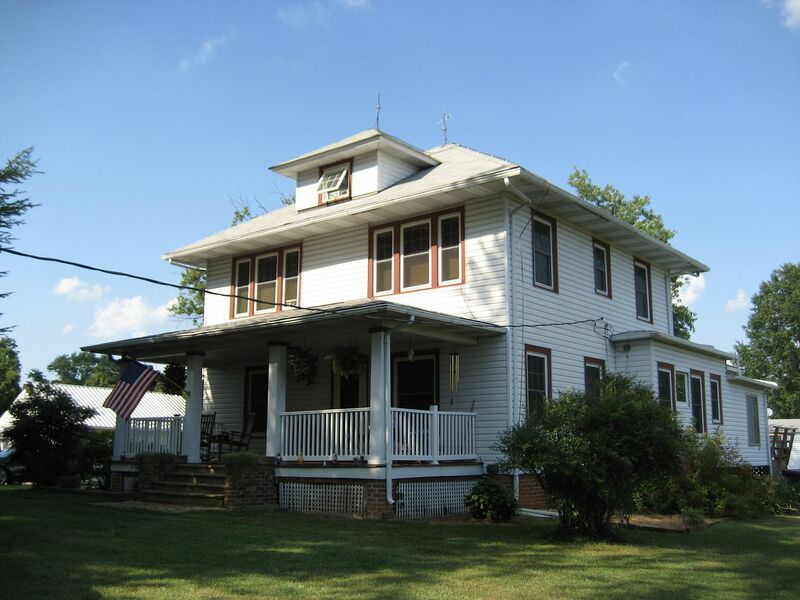 And here's the Hillrose in Brandy Station, Virginia. And best of all, for many years, it was owned by a famous Civil War hero, J. M. Cunningham, the highest ranking surviving field officer of the Confederate Army at the time of his death in 1939. He was 96 years old when he passed. More on this hero in the next blog. And interestingly enough, I discovered this glorious house thanks to a comment left at my blog! The home's owner contacted me and said he had a Sears Hillrose. If I had a nickle for every time I heard that! ;) But in this case, he really did! Beautiful, isn't it? It's a historically significant home, located in a historically significant city, and formerly owned by a historically impressive Confederate war hero. Wow. A true beauty from every angle! What a house, and it sits in such a beautiful, bucolic place. My oh my. In the next blog, we'll take a look at the inside of this fine old home. If you have any questions or insights, please leave a comment below! To read about Sears Homes, click here. Want to read my prior blog on solar energy? Here’s the link. Three years ago, I installed my first "solar system" on my little back yard shed. 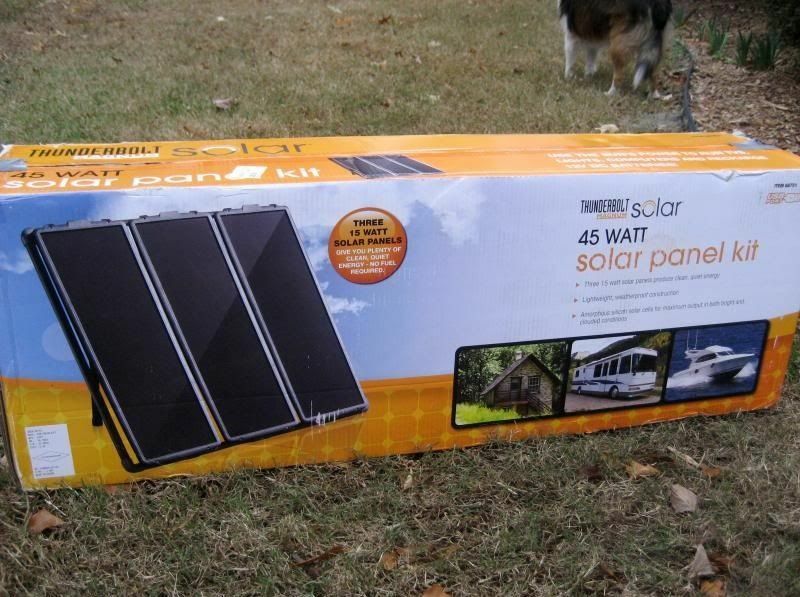 I purchased this "Thunderbolt" solar panel kit from Harbor Freight. Thunderbolt strikes me as a silly name, but it's a good solid product. Each panel produces 15 watts. This Spring, we had a new roof put on the house and shed, and after we had that work done, I couldn't bear to put those solar panels back on the pretty new roof. Instead, I decided maybe it was time to upgrade a little bit. 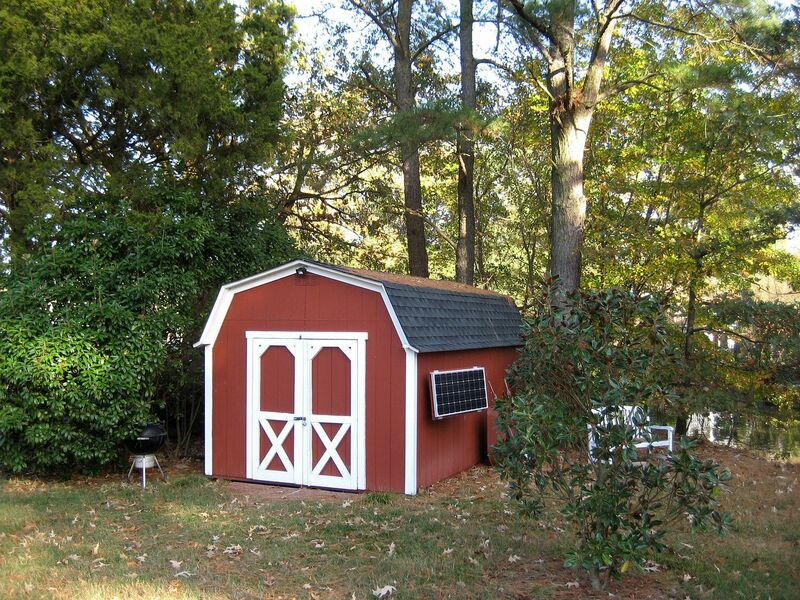 Pre-new roof, I had two sets of three panels atop the little shed roof. Each set of three produced 45 watts. 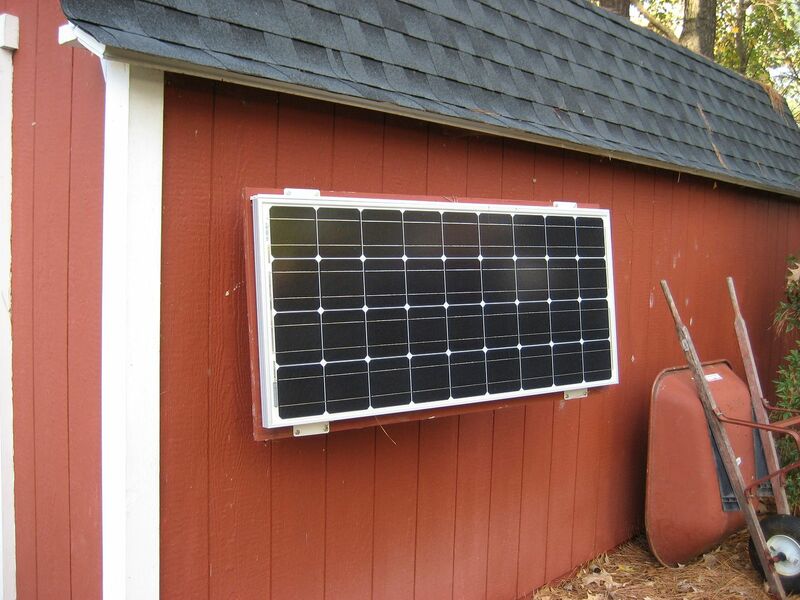 The Thunderbolt solar panels were amorphous thin-film panels (older technology) while the newer panel (shown here on the side) is a crystalline panel which produces 100-watts with a single panel. And it looks snappy, too. The panel is manufactured by Renogy. 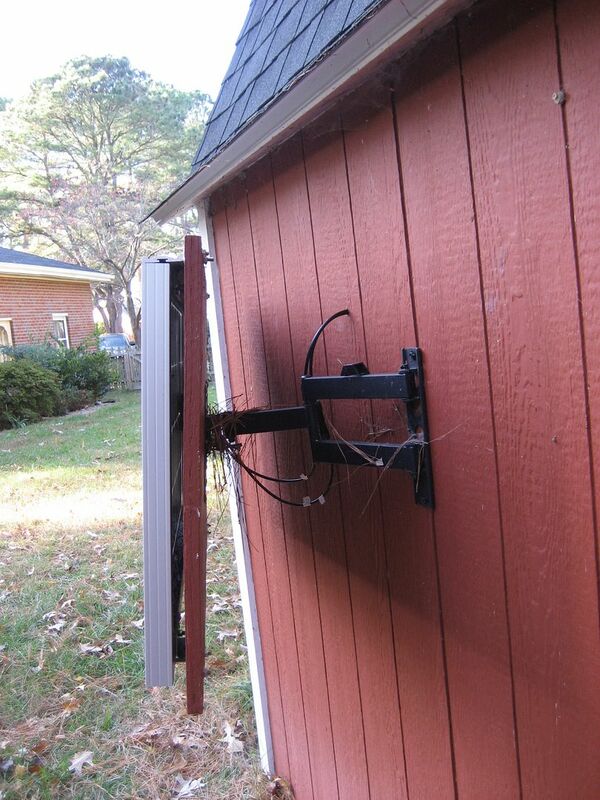 I mounted the solar panel to the wall using a 360-degree flat-screen TV mount. It was on sale at Amazon for $19 and was exactly what I needed. This model has a feature (probably undesirable to many) that after the arm is pivoted into position, it can be tightened into place so it never moves again. And mounting it on the side means I didn't need to drill fresh holes in that expensive new roof. Inside, there were some upgrades too. I've now got three 12-volt deep cycle marine batteries. 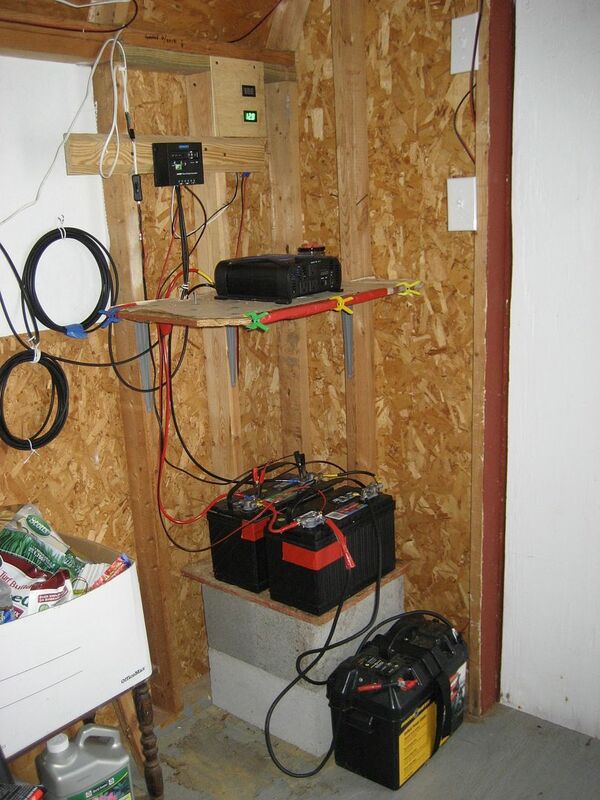 The battery on the floor is the one I use for my trolling motor, when I go out on the lake. 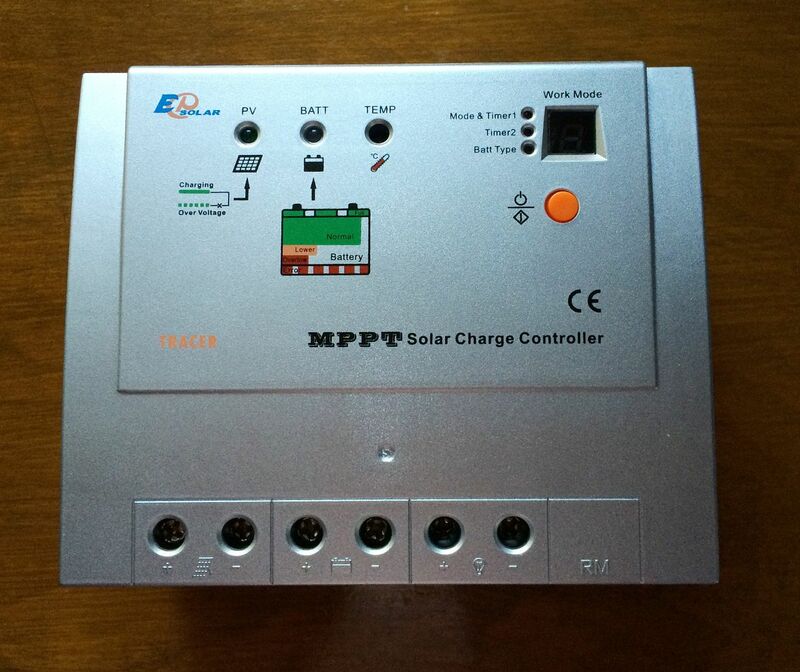 Prior to last week, I was using this MPPT solar charge controller. This little jewel cost $130 on Amazon and lasted only five months before it died. And it didn't die easy. It took out one of my digital meters when it went. Plus, it didn't just stop charging the battery; it was actually draining the batteries down to 4 volts. MPPT stands for Maximum Power Point Tracking. You can read more about MPPT by clicking here. It’s a webpage unto itself. 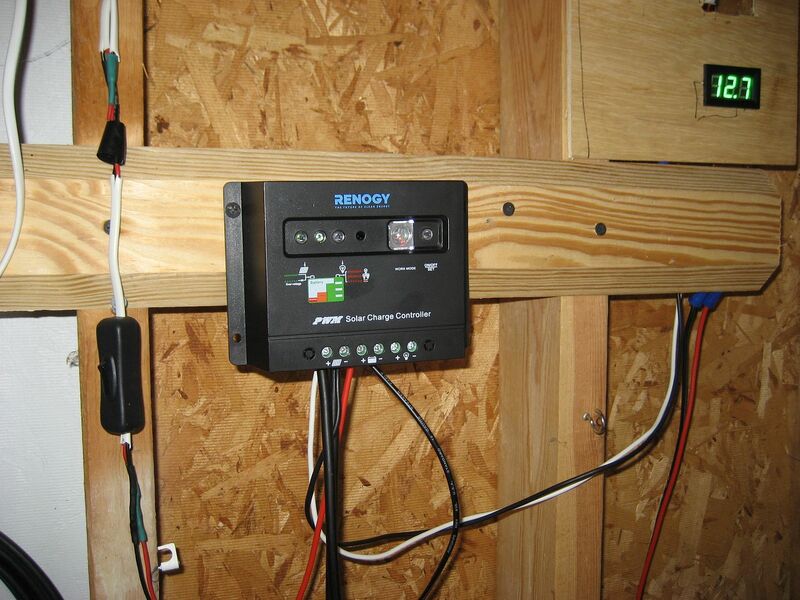 Shown above is the PWM (pulse width modulation) solar charge controller than came with the 100-watt Renogy panel. We'll see how it does. It's the dirt-poor cousin of the MPPT solar charge controller. If it lasts more than five months, it'll be my new hero. With those three batteries, I was able to upgrade the inverter a bit, too. Shown above is a 1600-watt inverter. The green display shows the current charge on the battery. The now-dead meter above showed the incoming voltage on the solar panels. And I added a few lights, too. Inside, I have four LED 12-volt lights. I mounted this one outside. It's also available at Amazon for the low, low price of $11.97 (or was). 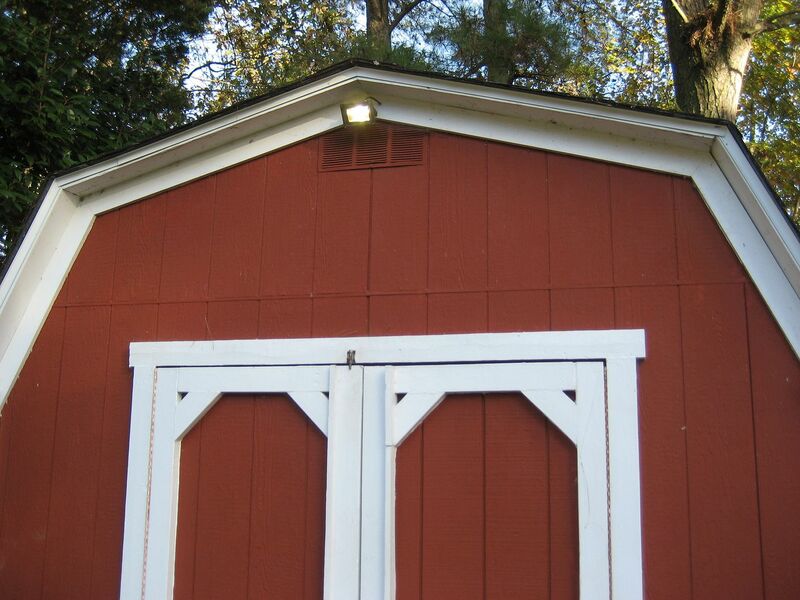 This small fixture puts out a surprising amount of light. 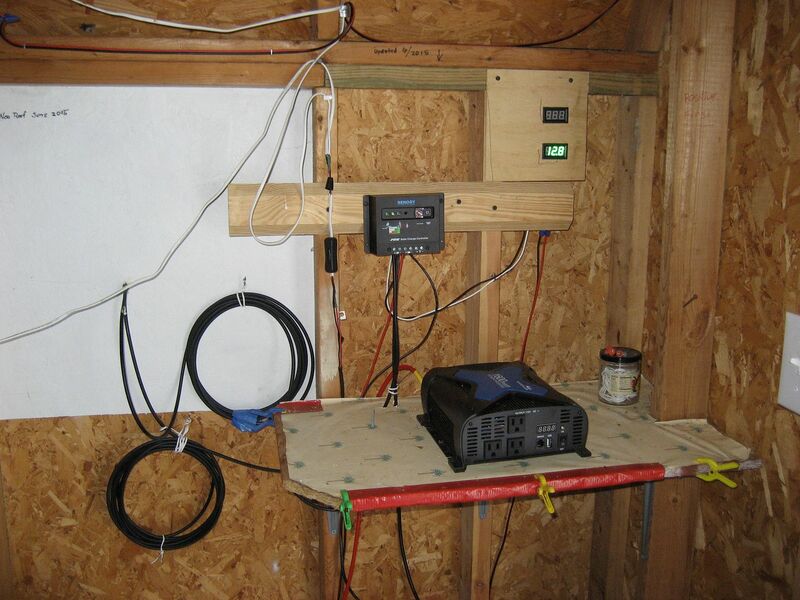 The old solar set-up was a lot of fun, and it lives on at Milton's house (my buddy and next-door neighbor). Three years later, it's still performing like a champ. Want to become a licensed ham radio operator? Check this out! If you’re here to read about Sears kit homes, click here. 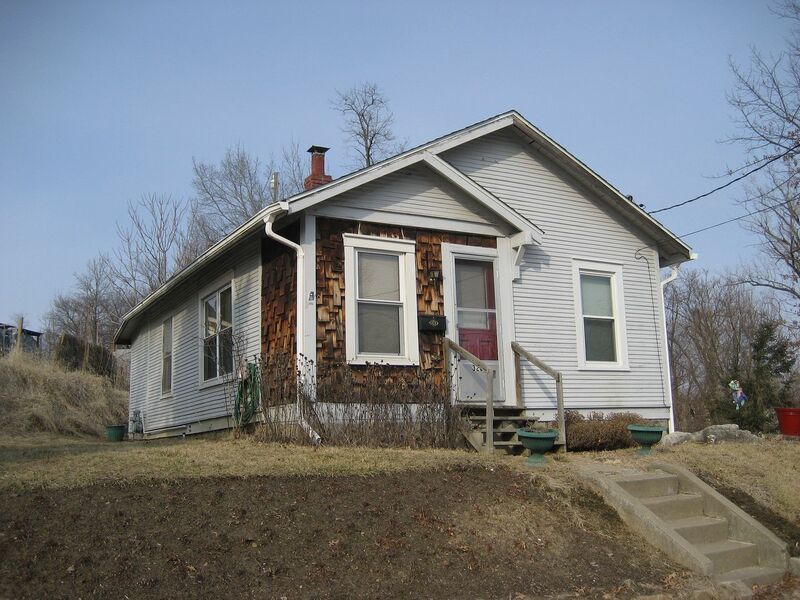 In Spring 2002, my new book on Sears Homes had just been published, and the Webster Grove Public Library (Missouri) was one of the first places that offered me a speaking gig. I’d never seen a sight like it. My name - on a great big banner - way up high where the whole world could see it. That night, I sold 40 books, which was about 32 books more than I’d ever sold before. People stood in line to buy a book. People stood in line, waiting patiently for me to autograph their book. People said many nice things to me. It was one of those defining moments in my life, where I first had hope that maybe - just maybe - I could turn this passion for old kit homes into a real job. Earlier this month, I returned to Webster Groves to poke around and see if I could find some kit homes I might have missed the first time (in 2002). Not surprisingly, I found several, but my #1 favorite was this Aladdin Sonoma, just about one mile from the Webster Groves Library. I’ve been hoping to find a real-life example of this sweet little house for a long, long time so it was quite a treat to find it in Webster Groves. To read a more recent blog on Webster Groves, click here. And “Webster Groves, Part III” can be found here. And you can read Part V here. Want to learn more about Aladdin kit homes? Click here. Because of its diminutive size, this was known as an "Aladdinette" house (1919). An interesting feature of this house was that it used a roll-away bed to save space. Oh, what a cute little house! 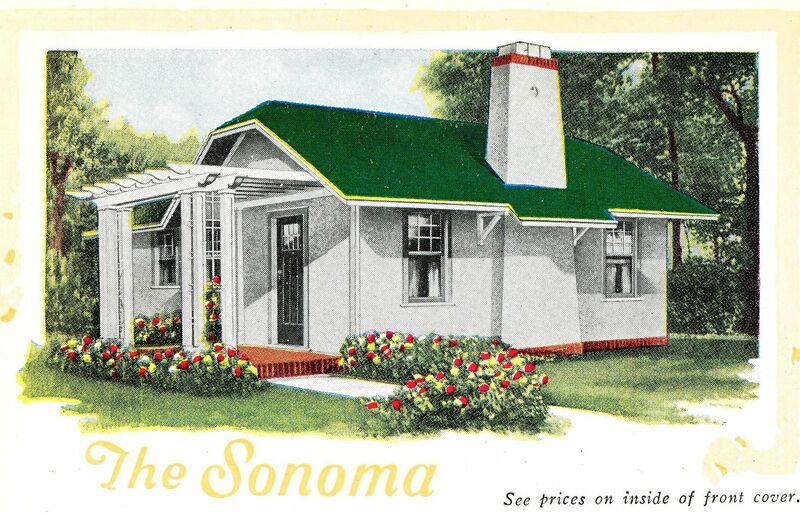 This "Sonoma" is the mirror image of the house shown above, and the pergola and exterior door has been converted into an enclosed porch. 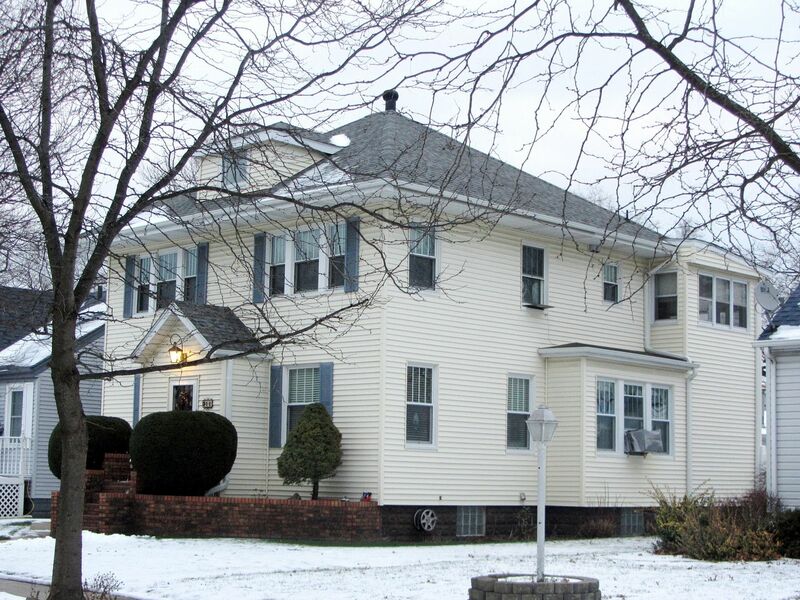 It's hard to see from this angle, but the roofline for the original house is a perfect match to the catalog page. 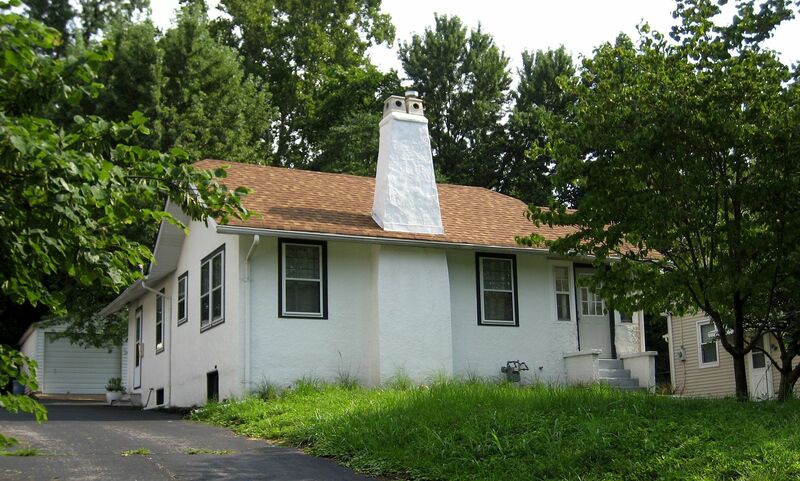 That extra-deep eave is missing from the chimney but I'd surmise that it went missing after the first roof replacement job in the 1940s. That extra bit of depth on the eave by the chimney is distinctive, but would have been a hard item to countenance when it came to maintenance (1919). 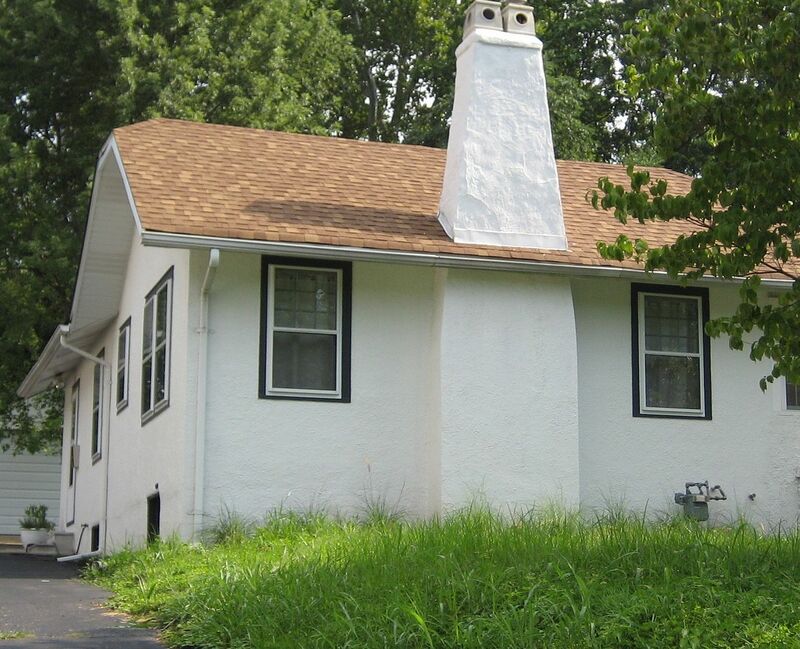 I've flipped the image (above) to match the house in Webster Groves. Notice the clipped gable. The view down the long side is also a good match. 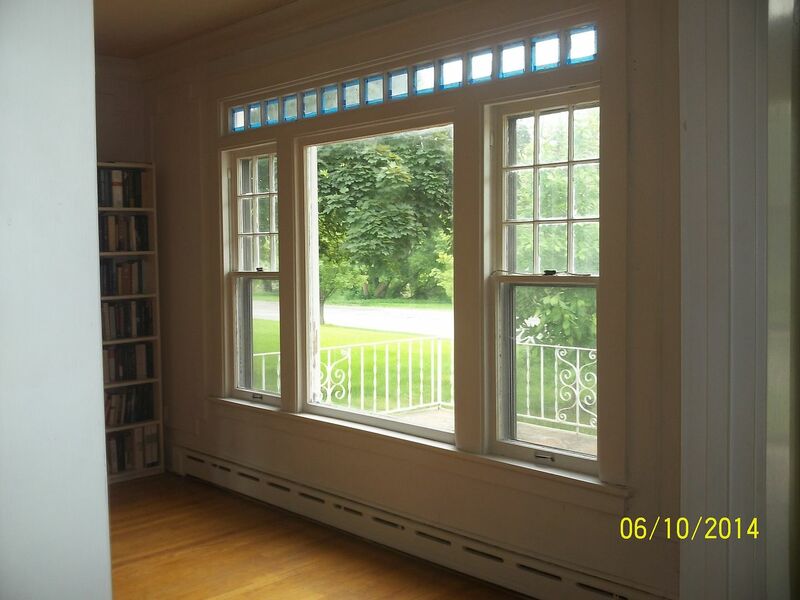 And last but not least, this darling home still has its original 9/1 windows. What a fine house! And to think that I found it in Webster Groves! To learn more about identifying Sears Homes, click here. 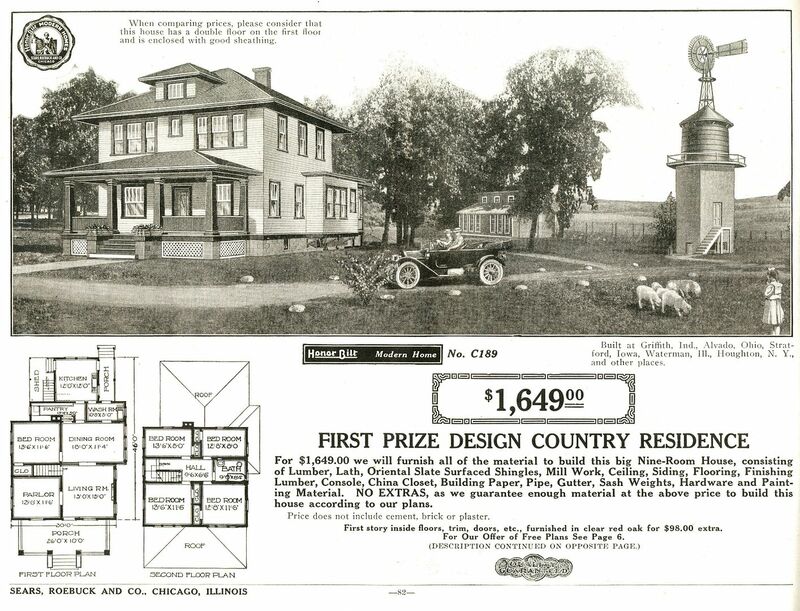 Mr. Selck of Evansville, Wisconsin won first prize with his design (Modern Home #189, “The Hillrose”), and second prize was awarded to W. L. Richardson of Cambridge, Iowa for Modern Home #184. Despite a lot of traveling, I’ve never seen an original Hillrose. 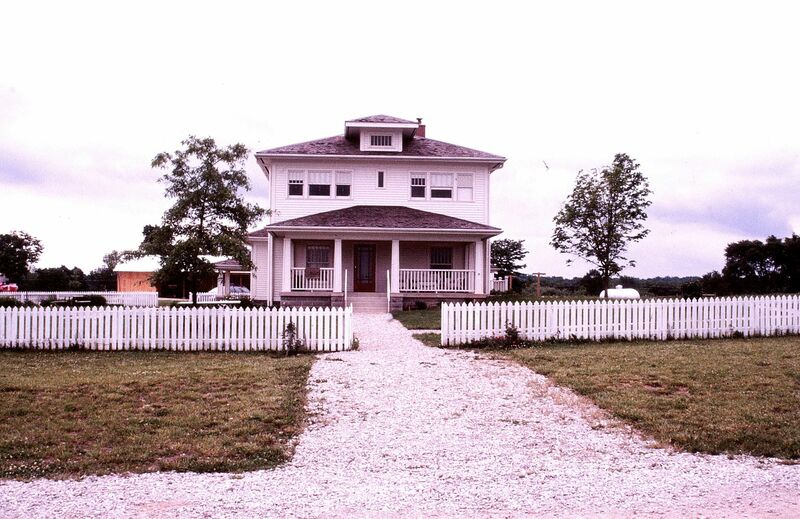 However, in 2005, I gave a talk at a $1,000,000 reproduction of the Sears Hillrose in Prophetstown, Indiana. The house was re-created several years ago by architectural historians who studied the old pictures and floorplans shown in a Sears mail-order catalog. The Hillrose in Prophetstown is now open to the public, and in addition to the reproduced Sears kit home, there’s also a large working farm on the site. When there in 2005, I had a thorough tour of the inside and snapped a few photos. As I told the director, I really loved what they’d done with the place. I snapped a few photos (old 35mm slides), which you’ll see below. In 1916, the Sears Hillrose was offered for less than $2,000. More than 90 years later, the reproduction Hillrose cost more than $1 million. To read more about The Contest, click here. Want to join our group on Facebook? Click here. 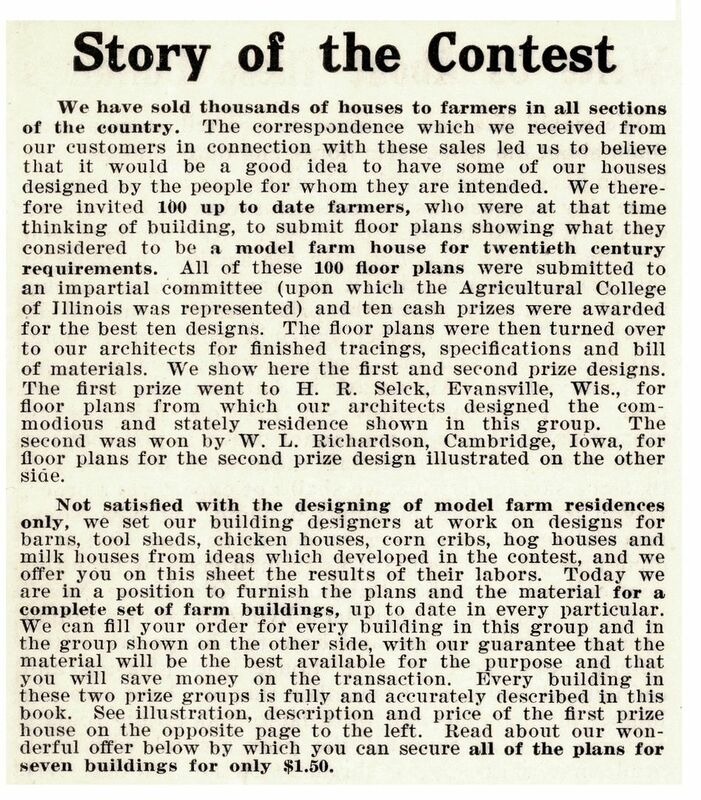 The contest was featured in an undated brochure (about 1914). 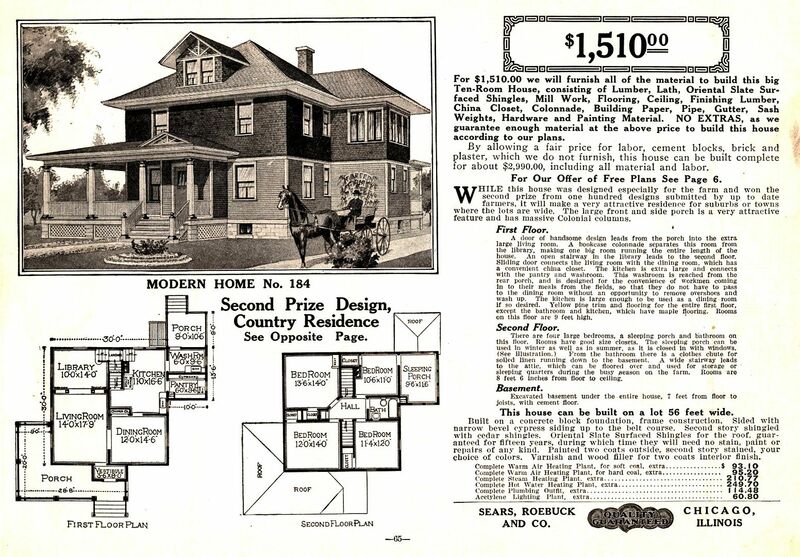 The first prize design was Modern Home #189, or The Hillrose (1914 catalog). The cost to build the contemporary Hillrose was $1,000,000. 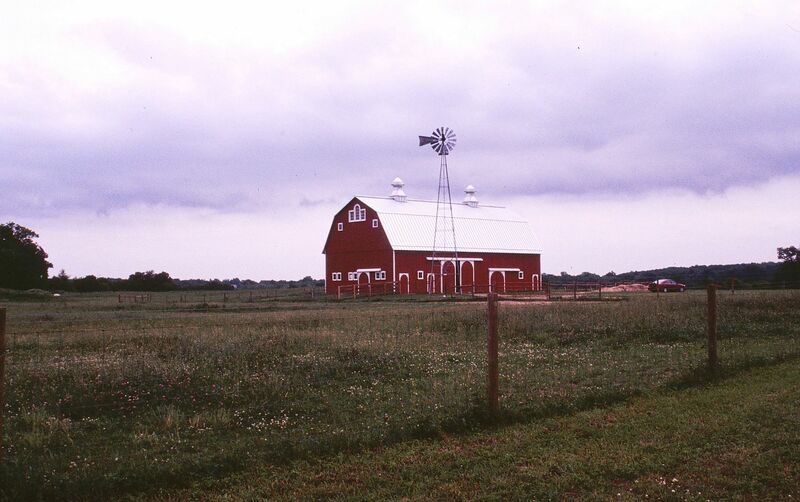 Despite my best efforts, I was not able to match the Sears barn to any known Sears kit barn designs. Upon reflection, I'm not sure this was a bonafide reproduction kit barn. Memory can be fickle at times, especially when you're relying on a conversation that you had 10 years ago. That's my little red 2003 Camry to the right of the barn. 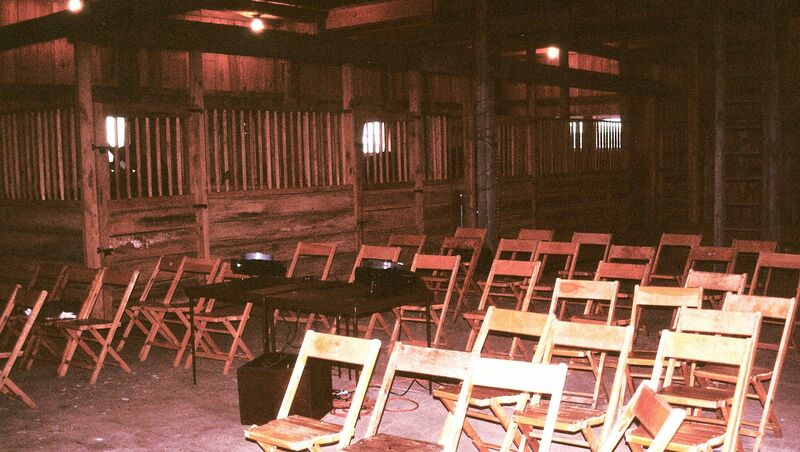 As mentioned in the prior blog, I ended up giving my talk that night inside this barn. Back in the day, I toted around two slide projectors and would show the two slides on two screens, comparing extant houses with vintage catalog images. I was rather relieved when the world went to digital. Organizing all those slides for every talk was a massive undertaking. I finally gave away those slide projectors in 2011 when we moved into a new house. The interior of the Hillrose was a thing of beauty. It disappears in the shadows, but yes, that's a chamber pot under the bed. 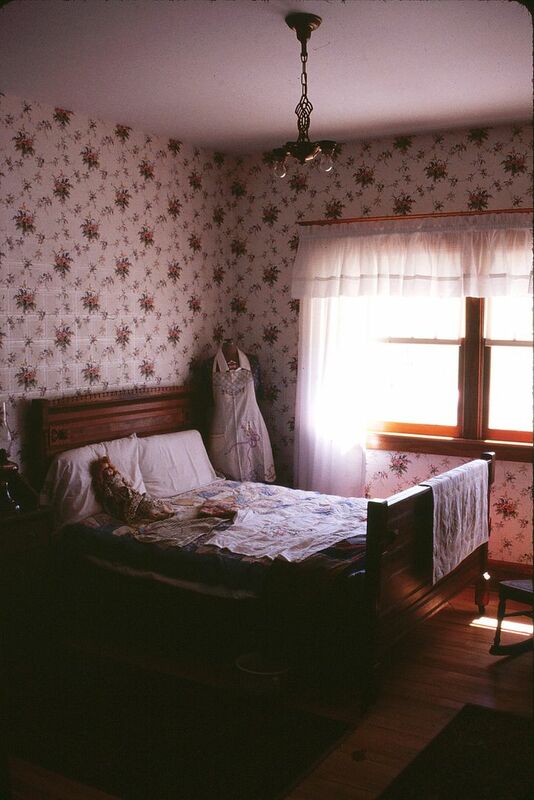 The wallpaper was gorgeous, and the rag doll was a nice touch too. For someone who's spent their life trying to figure out how to get back to the 1920s, I'd say the kitchen was utterly enchanting. 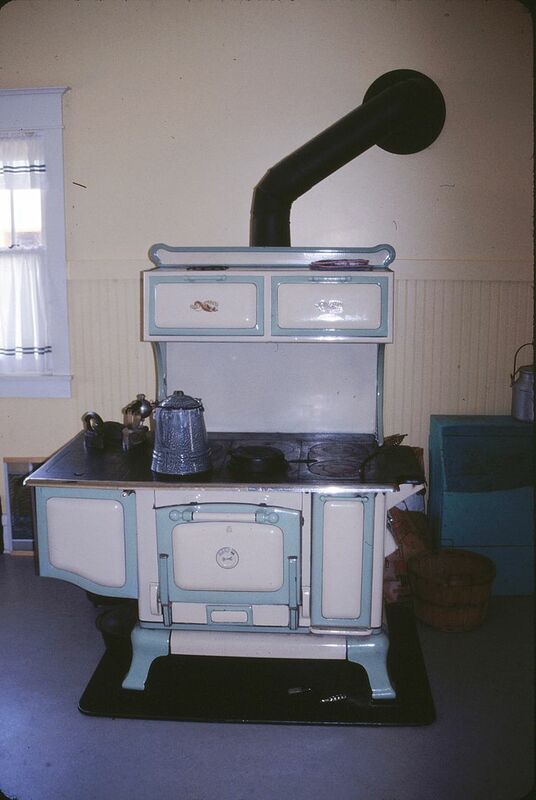 And who doesn't secretly dream of a turquoise and white cast-iron, wood-fired cookstove? 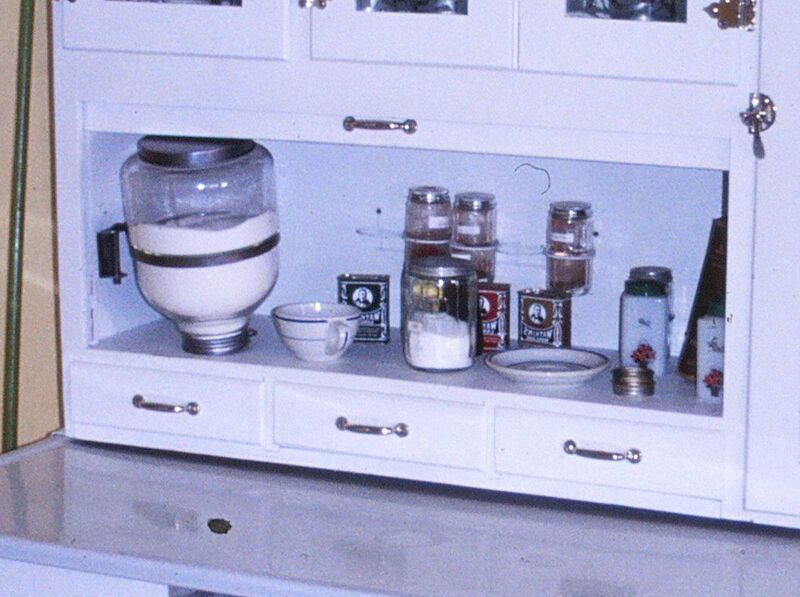 And what proper Indiana homestead wouldn't have a Hoosier cabinet? Even though I've never seen an original Hillrose, the 1916 catalog shows that there were Hillroses buit in these cities. Please call your cousin Bertha in Griffith, Indiana and ask her to find the Sears Hillrose there and then ask her to take a photo and send it to the lady in Norfolk. Or maybe your Aunt Beulah in Alvada, Ohio? Or Granny Kittle in Waterman, Illinois? Work with me here. I need a photo of a real life Hillrose. Really I do. 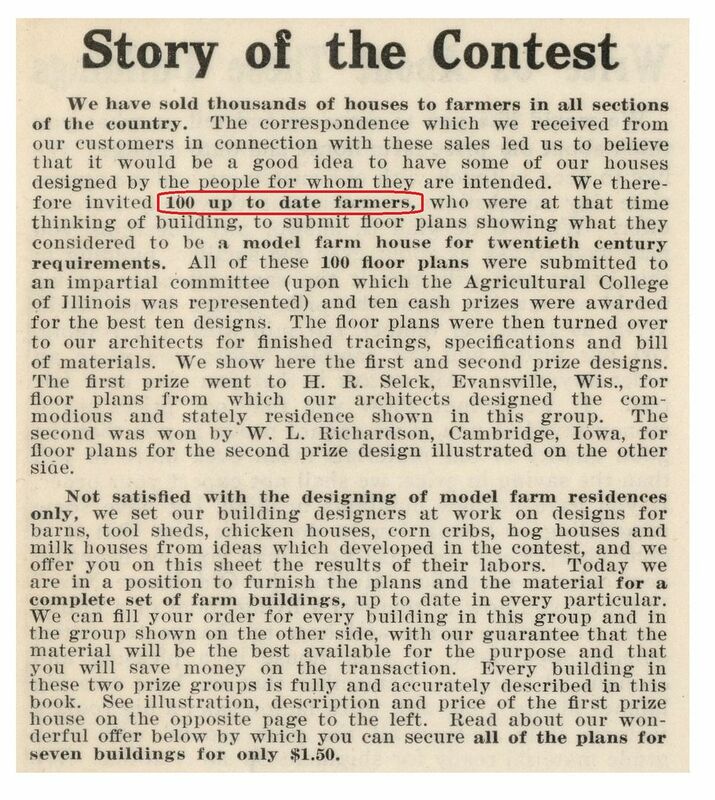 It started out in 1913 as a contest. 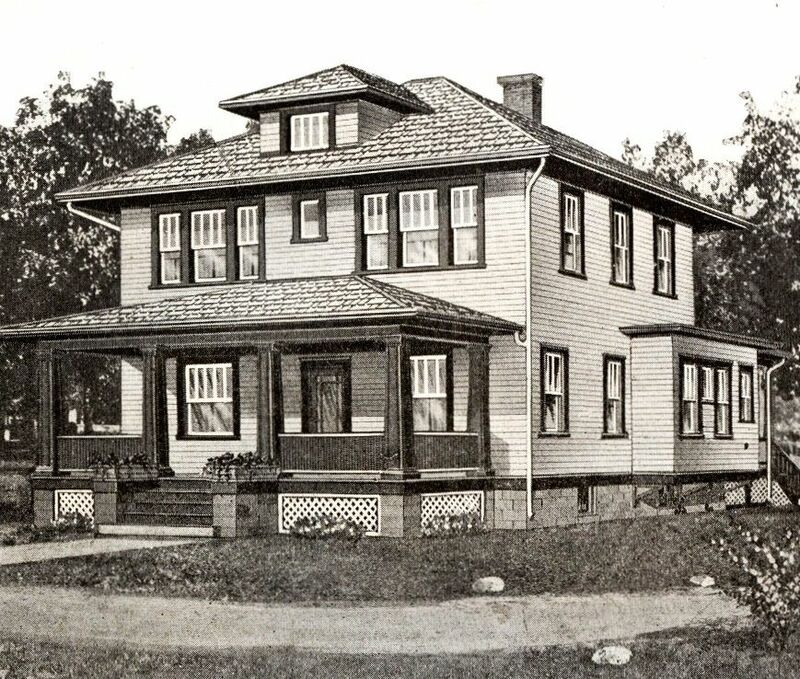 Mr. Selck of Evansville, Wisconsin won first prize with his design, which came to be known as The Hillrose (Modern Home #189). 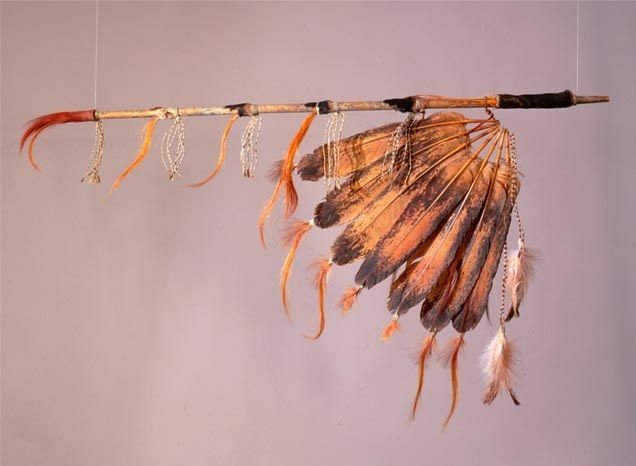 In addition to having his creation featured in subsequent catalogs, he also won $50 - in gold. Second prize ($35 in gold) went to W. L. Richardson of Cambridge, Iowa. 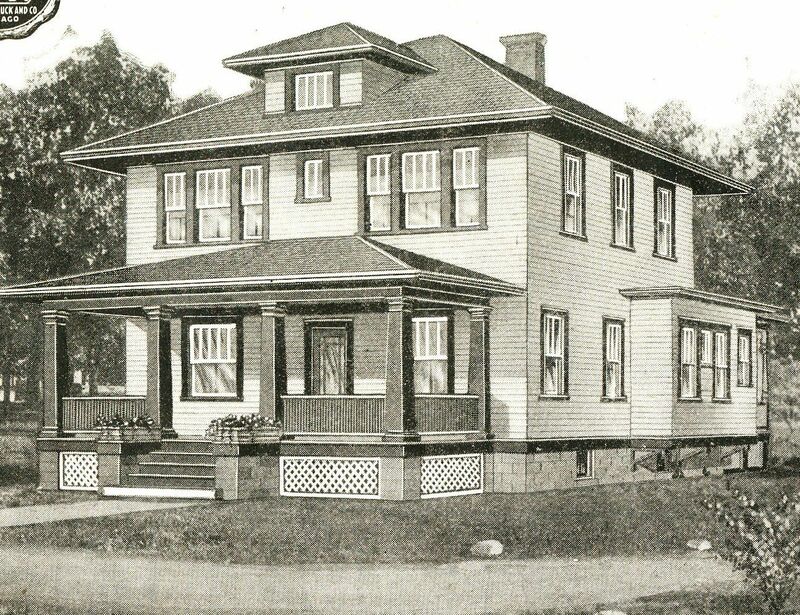 His house (Modern Home #184) didn’t last long enough to be granted a name (1918), and in fact, was gone by 1916. Despite 14 years of wandering and researching, I’ve seen only one Sears Hillrose and that was in Prophetstown, Indiana (near West Lafayette) and it was less than 20 years old. The house was re-created several years ago by architectural historians who studied the old pictures and floorplans shown in a Sears mail-order catalog. 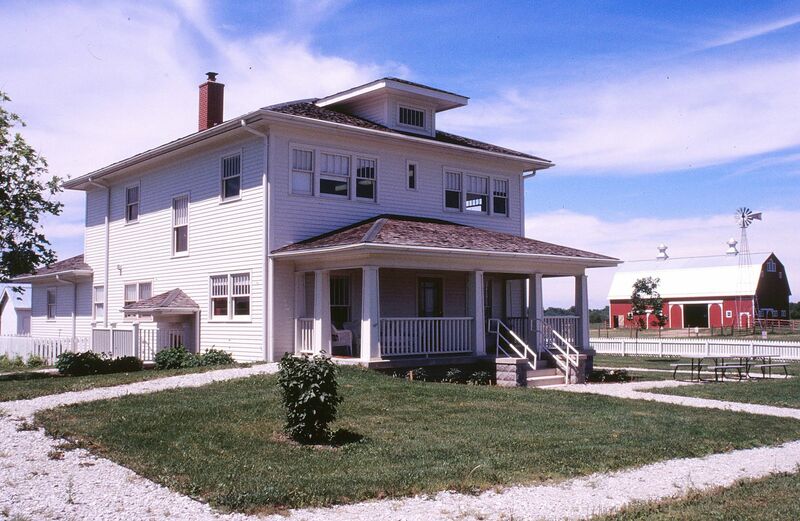 The Hillrose in Prophetstown is part of a museum exhibit that offers an interpretive display of a working farm. The first floor of the house is true to the catalog image and to the time period. 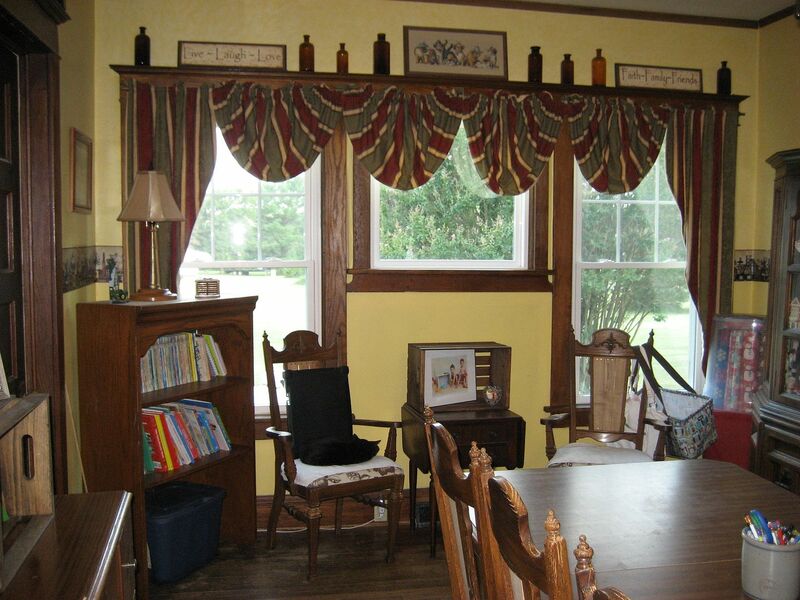 The interior is filled with period furnishings, appliances and even ephemera. An old Sears catalog sits on an end table in the front room of the Hillrose. The second floor is thoroughly modern, not open to the public, and is used as administrative offices. 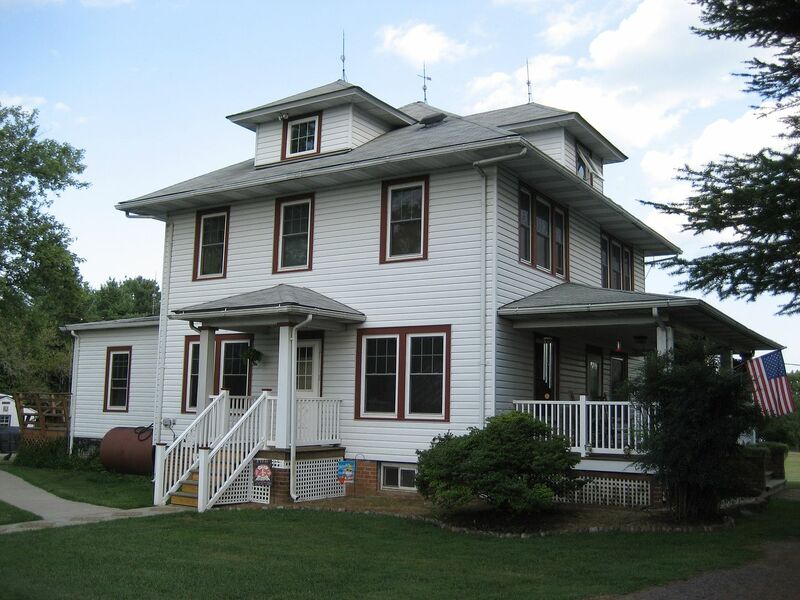 In 2005, I traveled to Prophetstown to see this recently built Hillrose “in the flesh” and to give a talk on Sears Homes. Originally, it was planned that I’d give the talk in the front room of the Hillrose (with space for 30 attendees). Not good. These talks - even 10 years ago - often drew 100+ visitors. The only option available at the last minute was the barn. And it was a real barn, with real critters and hay and implements. That evening, at 7:00 pm, I addressed about 90 people, four goats, six cows and several chickens. In the barn. This newly built Hillrose was a pricey little affair. 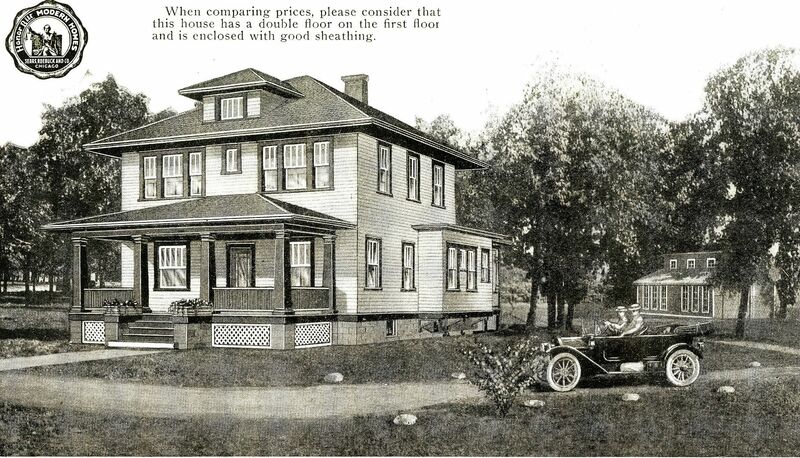 The 1916 Sears catalog showed the house offered for $1,649. 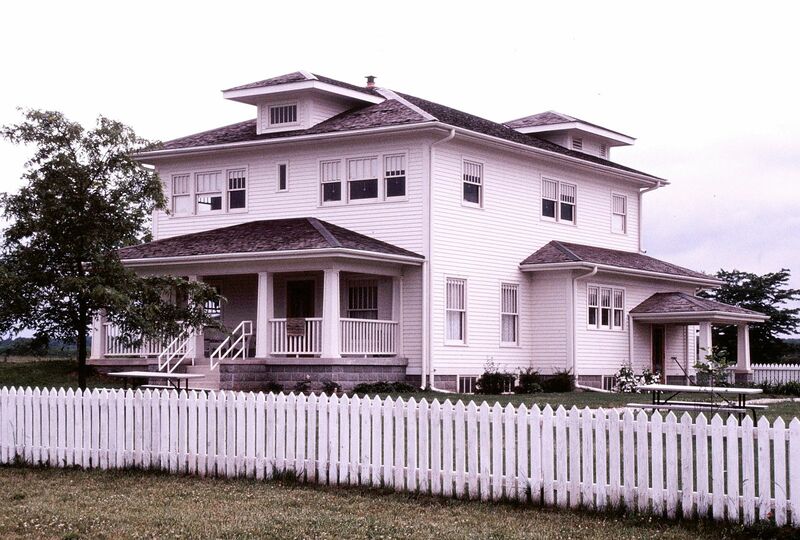 More than 90 years later, the Hillrose’s contemporary cost exceeded $1 million, due to the expense of re-creating an early 20th Century farm house. And now Prophetstown has a real treasure and a tourism attraction that will endure for decades to come. There’s a real-life Hillrose in Brandy Station, Virginia! Click here to see inside the Hillsboro in Prophetstown. To read more about this Hillsboro in Indiana, click here. 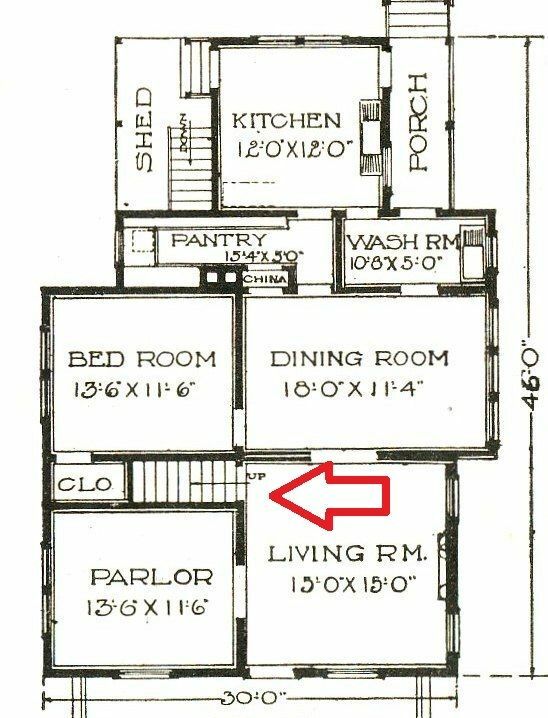 Want to learn more about to identify a Sears House? Click here. I wonder what an "out of date" farmer looks like? This image came from a promotional brochure, dated about 1914. Take a moment and read it in its entirety. It's fun! 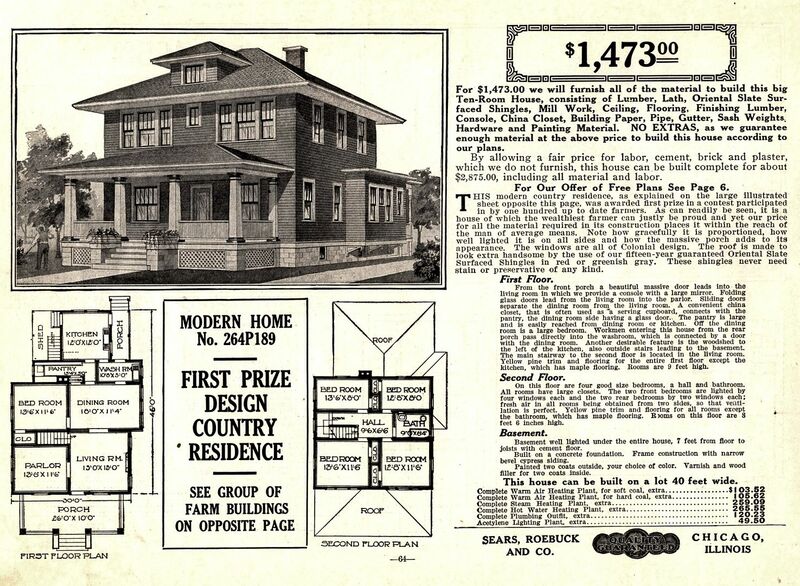 Modern Home #189 was the prize winner, and garnered $50 in gold for Mr. Selck of Evansville, Indiana (1914 catalog). 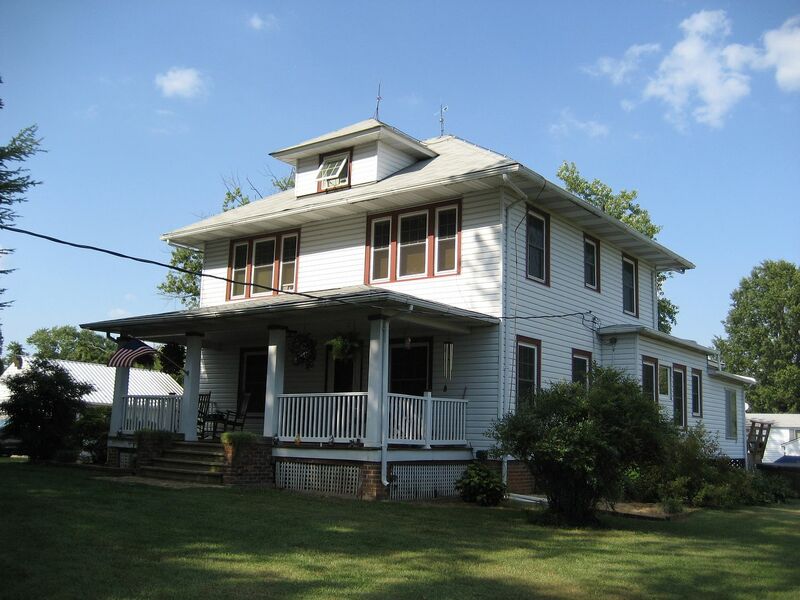 Fine house (with more than 2,000 square feet) for a mere $1,473. 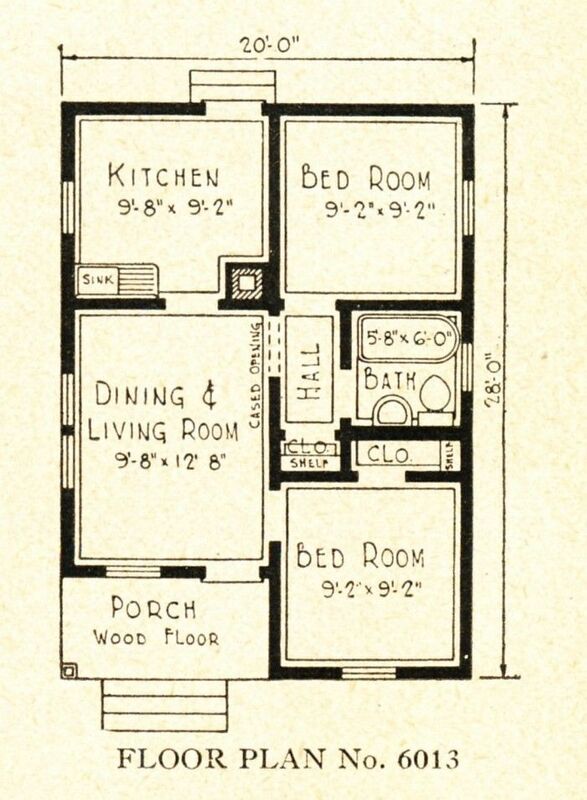 W. L. Richardson of Cambridge, Ohio won $35 in gold for this design (1914 catalog). 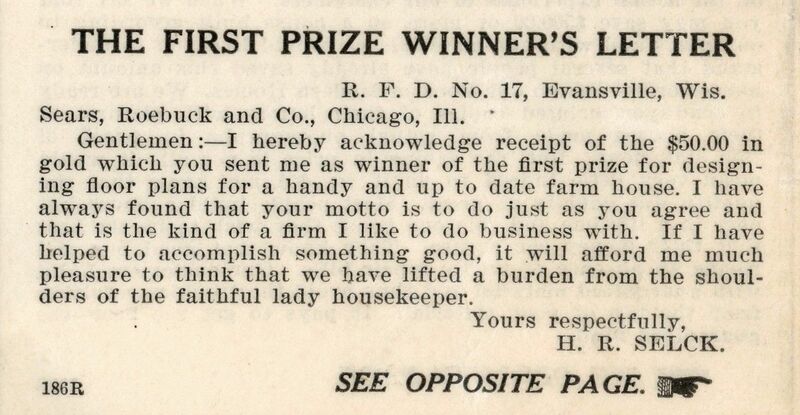 Apparently, Sears asked for a letter from the first prize winner. And the second-prize winner, too. Aladdin was actually the originator of the business of selling kit homes via mail-order catalogs, but what's a little promotional puffery between friends?. 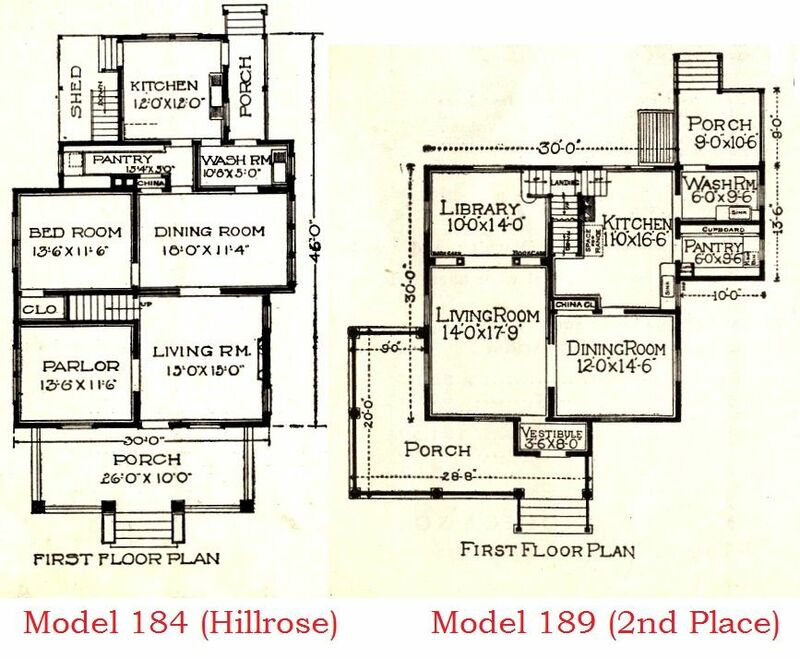 A comparison of the two houses - side-by-side. I guess the woodshed was the thing that carried the day. 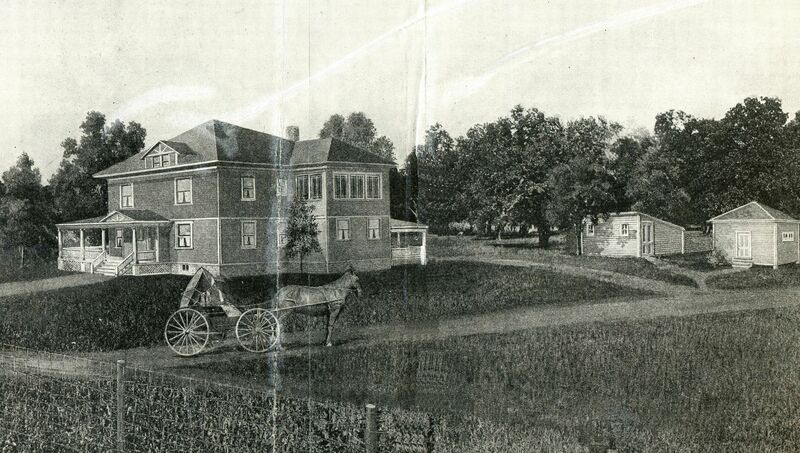 A panoramic view of Modern Home #189, showing not only the house, but outbuildings and livestock. A closer view of Modern Home #189 (The Hillrose). 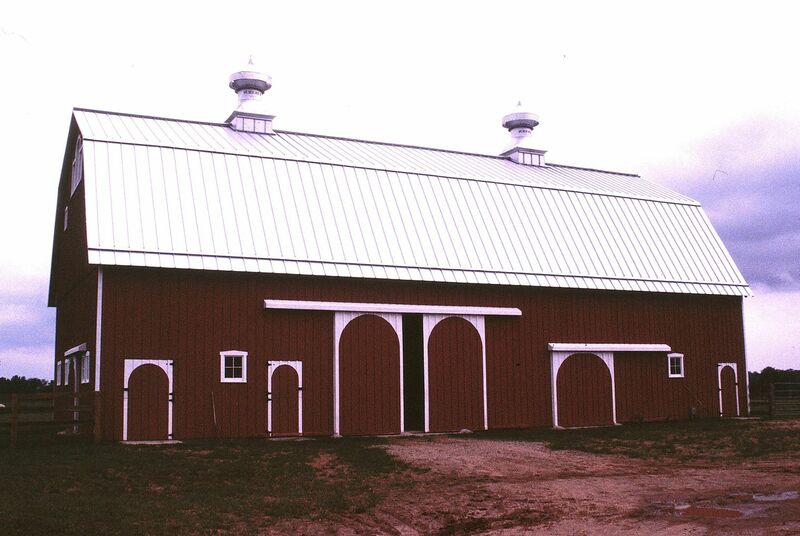 A close-up of the Sears kit barn, as shown with The Hillrose (above). 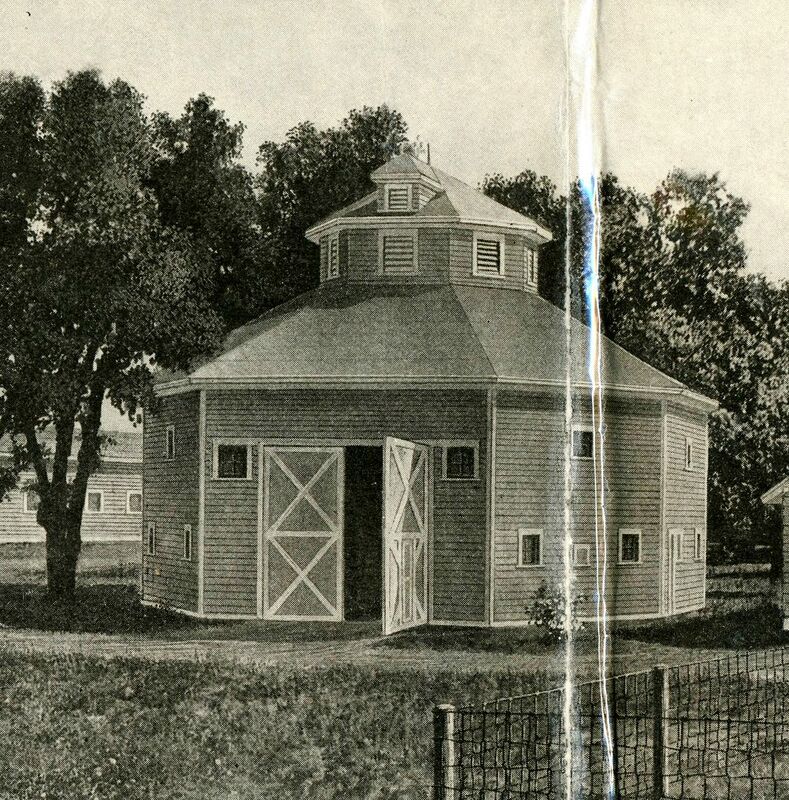 I love that dormer atop not just the round barn but the silo, too. 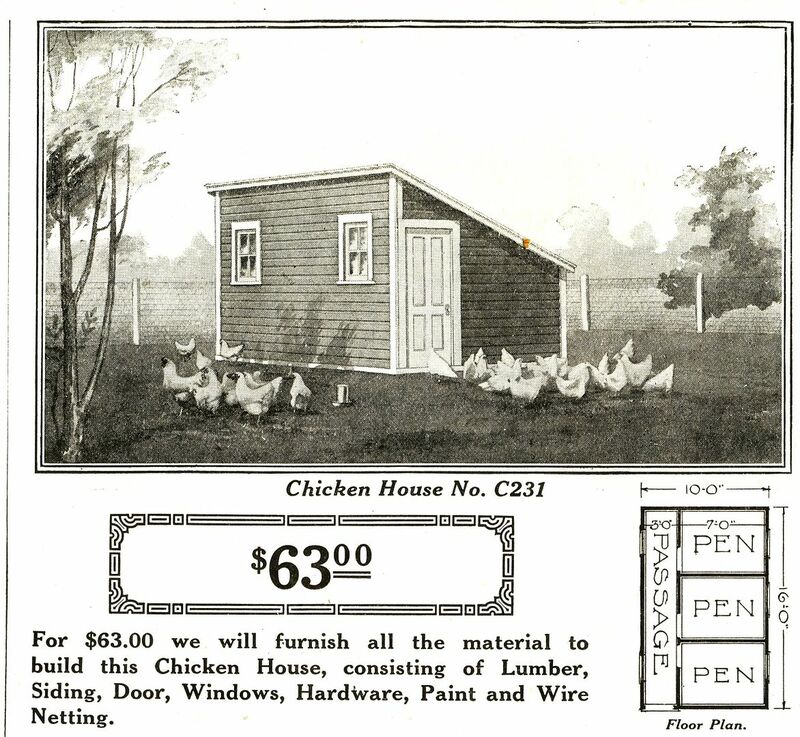 Chicken House #221 is shown next to the Hillrose. Here's a long view of the 2nd prize winner. 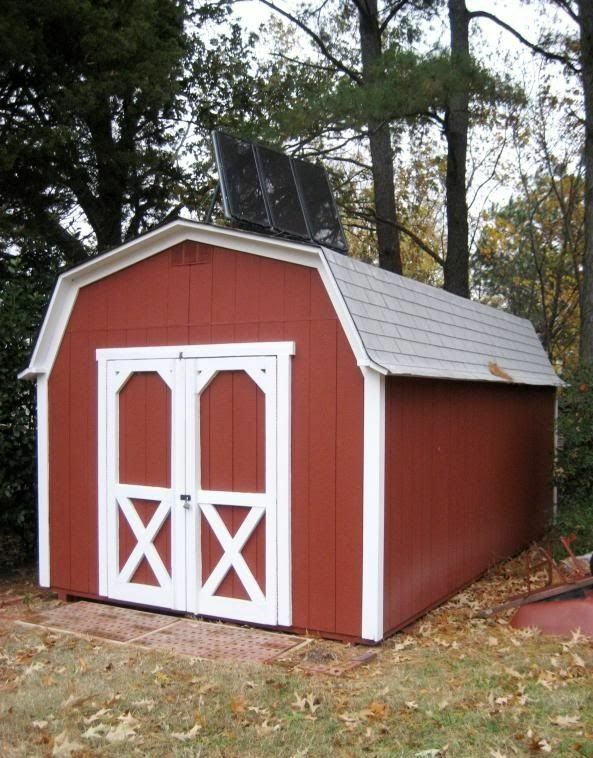 He has a chicken coop, but it's not the #221. He has a vehicle, but it's only one-horse power. 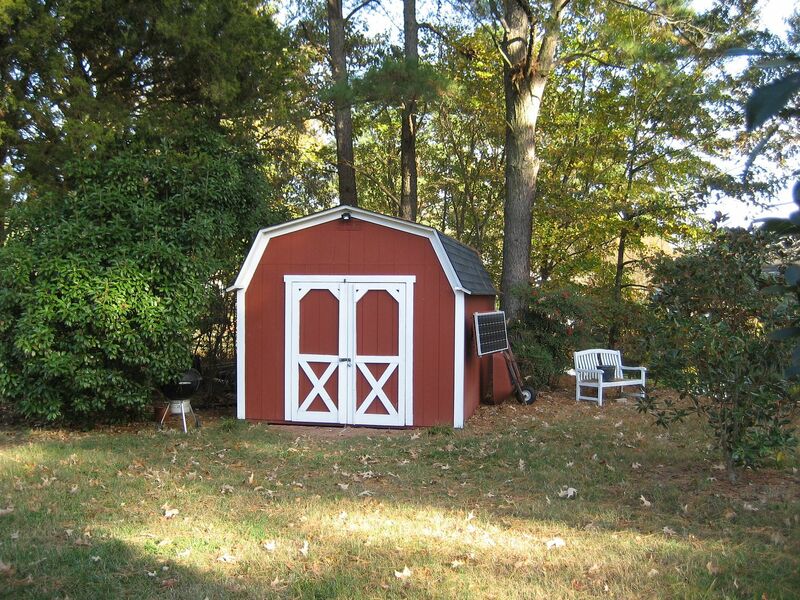 He has an outbuilding, but it's a little milk house. Second-prize winner got cheaped out on the chicken house. 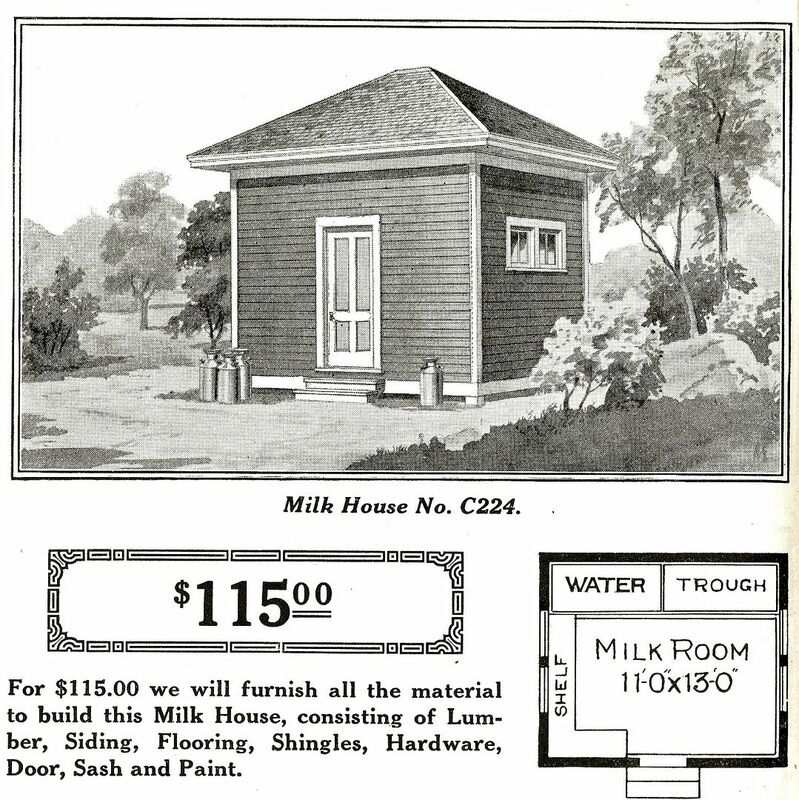 Nice little milk house, though. Even though I've never seen a 1910s Hillrose, they are out there - apparently (1916 catalog). Alvado, Ohio can't be that big. It can't be too tough to find a big old Sears foursquare in little old Alvado. Perhaps a kind-hearted Avacadoan will find this Hillrose in their town and snap a photo for moi. Or maybe someone in Griffith will embark on this mission of mercy. One can hope. I need a picture of a Hillrose. However, I don't know if any of these homes were ever built. 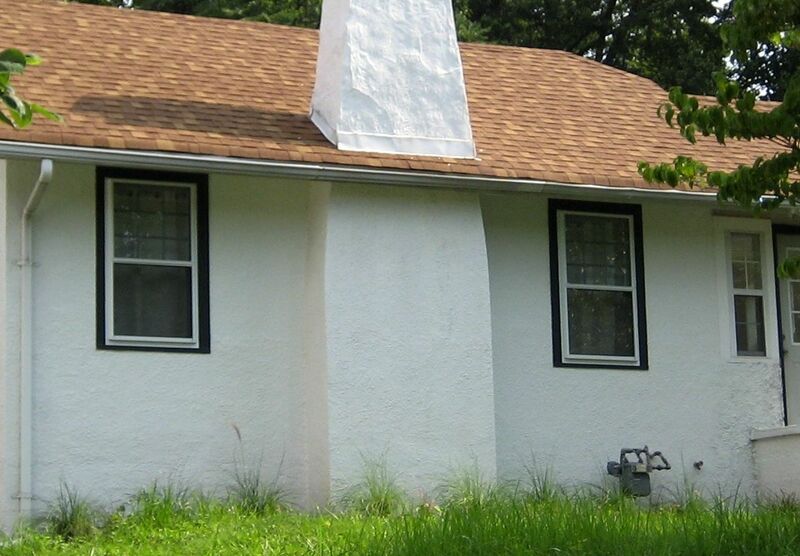 Good news is, this house is so distinctive, it'll be easy to spot! 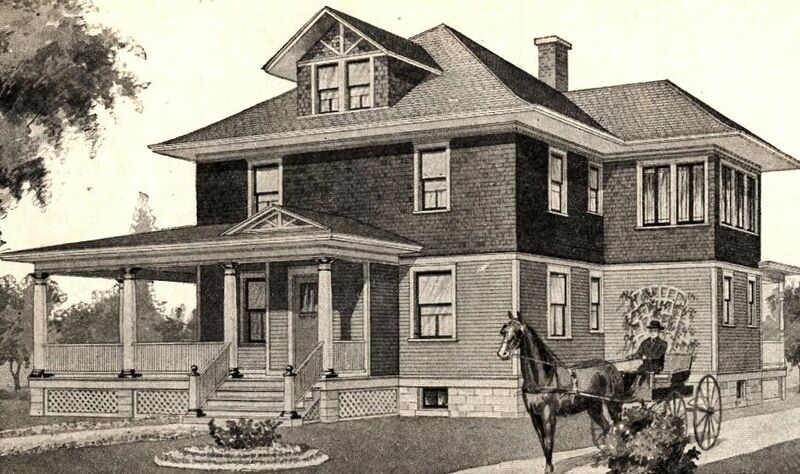 In addition to being an L-shaped foursquare (yeah, really), it has an offset porch, small vestibule, pedimented porch roof, big gabled dormer, oversized eaves and a dainty-looking horse in the front yard. The Modern Hillrose in West Lafayette is a real dandy, and it's the only Hillrose I've seen. A view of the Hillrose from the same angle as the catalog. My favorite shot of the Hillrose, showing the barn in the background. Just a little archival storage tip: If you're going to collect rare Sears House ephemera and sell it on eBay, don't cut it up into tiny bits and then laminate the whole caboodle with thick plastic. This photo here is to help explain why images 1, 4, 5 and 6 look like they were scanned through wax paper. Because - actually - they were. Special thanks to Rachel Shoemaker for purchasing this rare brochure and sharing it! To read Rachel’s wonderful blog, click here. 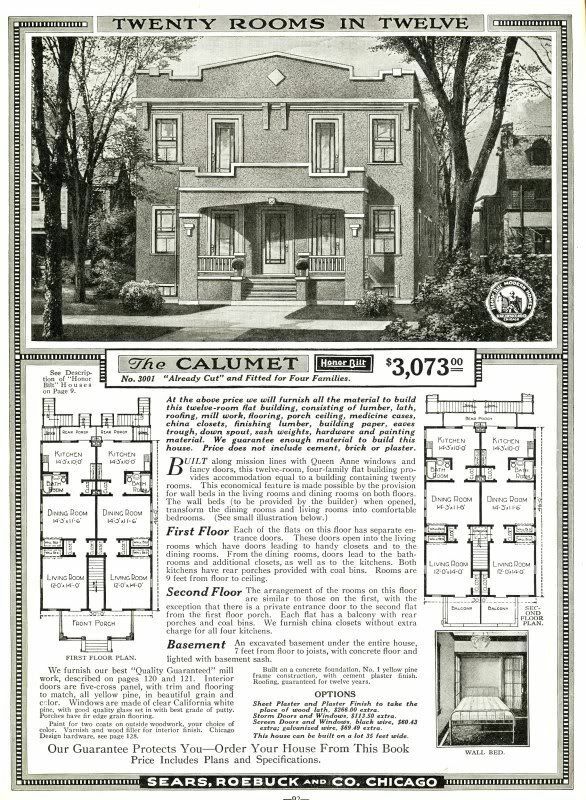 The Calumet is a rare Sears kit house that was offered for a brief time in the late 1910s and early 1920s. Sears did offer a few apartment buildings (yes, as kits), and the Calumet was one of them. 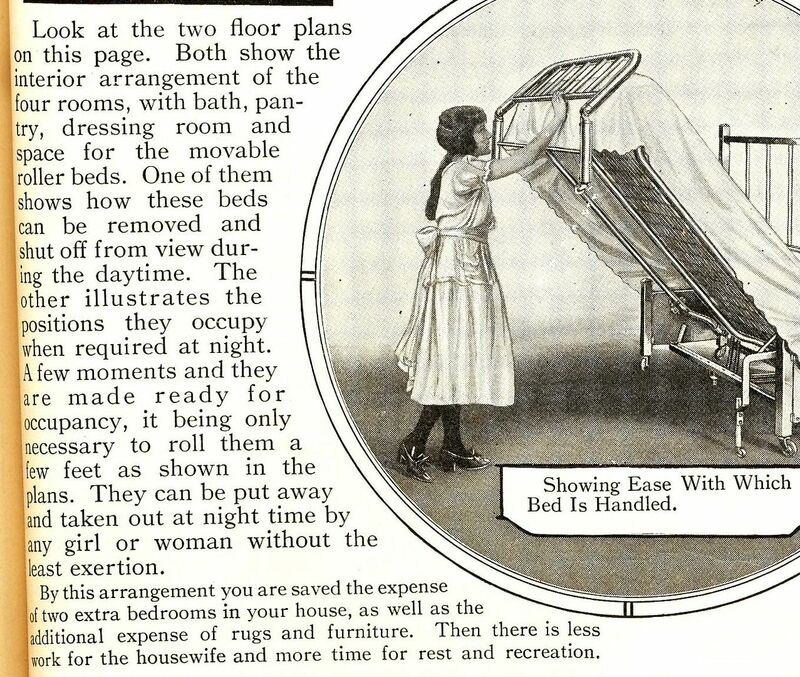 My favorite feature of the Sears Calumet is the wall-bed, and the Calumet had two wall beds per unit. The bed frame was included in the kit (but not the mattress). They’ll be so impressed with your esoteric knowledge! Want to learn more about Murphy Beds (Wall Beds)? Click here! The Calumet, as seen on Wikipedia. The Calumets had four porches, each with their own coal bin, whichwas nothing more than a small bin. Not nearly as luxurious as it sounds. 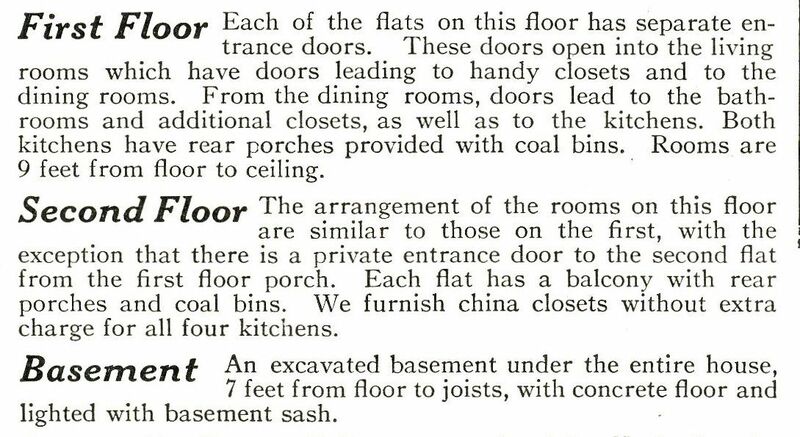 Plus, it has "handy closets." I wonder which model had the "unhandy closets"? That would have been a heck of a kit house! 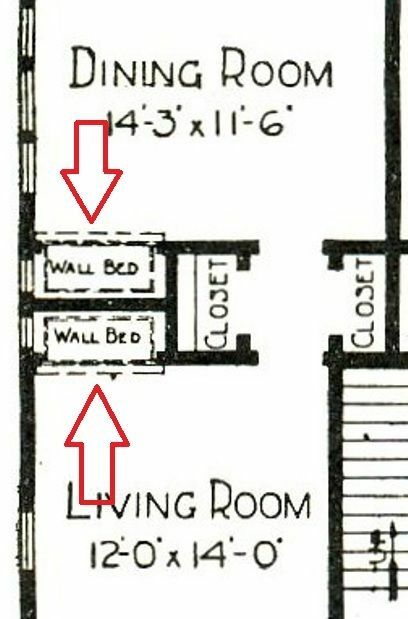 Notice that the wall beds have their own windows - in a closet! 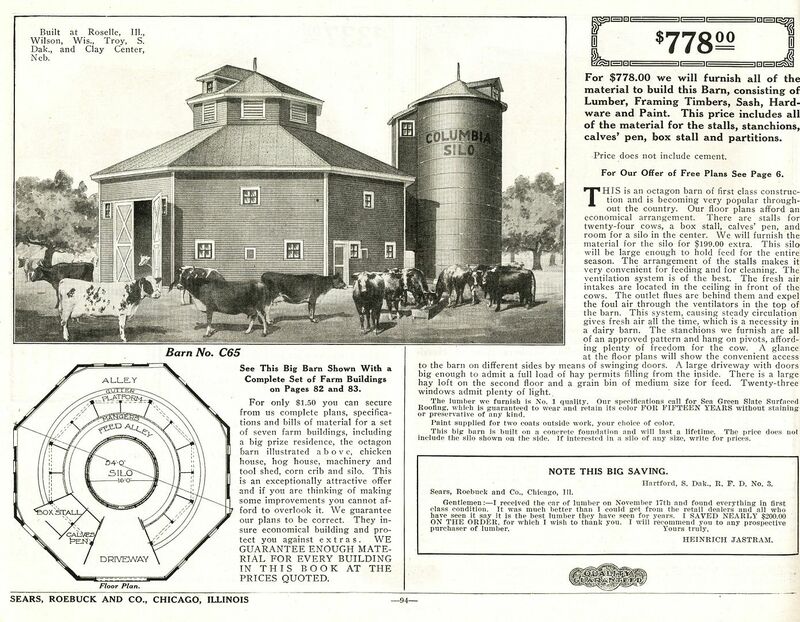 The Calumet - as seen in the 1918 catalog. The only Calumet I've ever seen - and it's in Bloomington, IL. You can see those two "closet-bed windows" on the right side. Sadly, the second-story porches are long gone. That first step outside of those 2nd floor doors is a doozy! Do you think that the wallbed in the Calumet *ever* looked as good as it did in this accompanying image? I kinda doubt it! In another catalog promotion, Sears promises that folding up that wall bed is so easy even a child can do it. 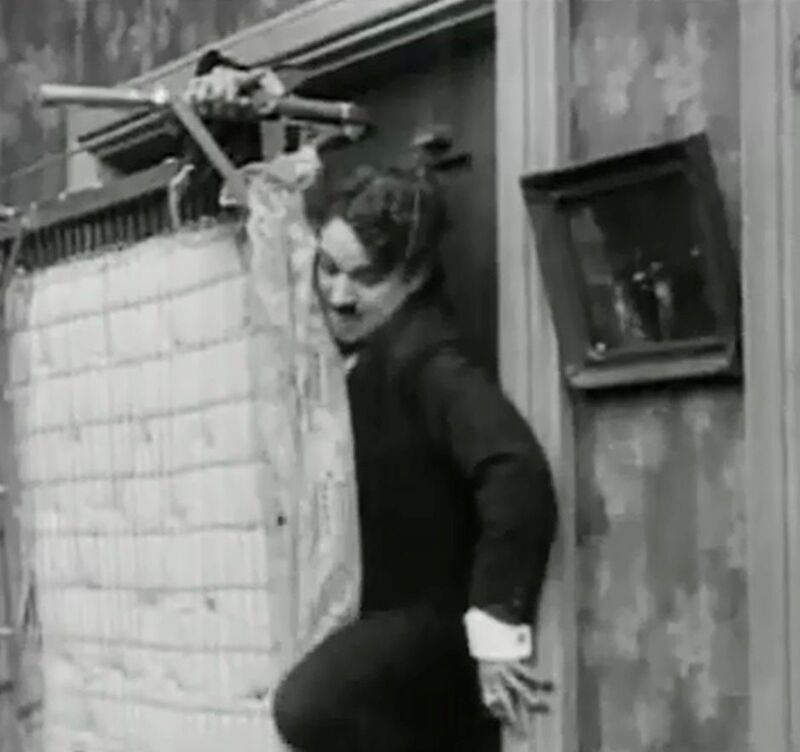 In the silent short film (title, "1:00 a.m."), Charlie Chaplin does battle with a recalcitrant wall bed (also known as a murphy bed). The full video (about 10 minutes) is at youtube. See link below. To see the Charlie Chaplin short, click here. To read another fascinating blog, click here. 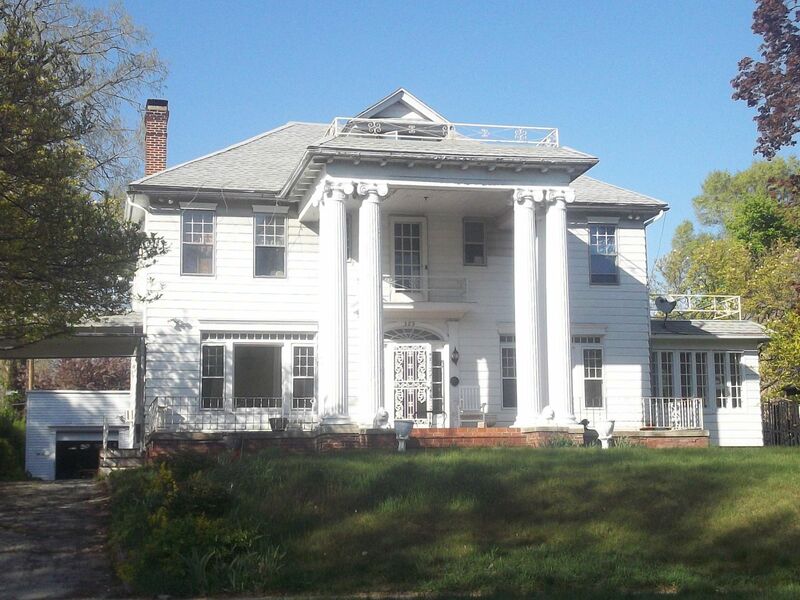 A *Beautifully* Original Magnolia in South Bend - For Sale! For many years, I’ve wondered what it would be like to see a Magnolia in original condition. The Sears Magnolia in South Bend was recently listed for sale, and the Realtor kindly sent me a few pictures. It can be described in one word: STUNNING. These photos give us a rare opportunity to step back in time almost 100 years, and see what the Sears Magnolia looked like when built. 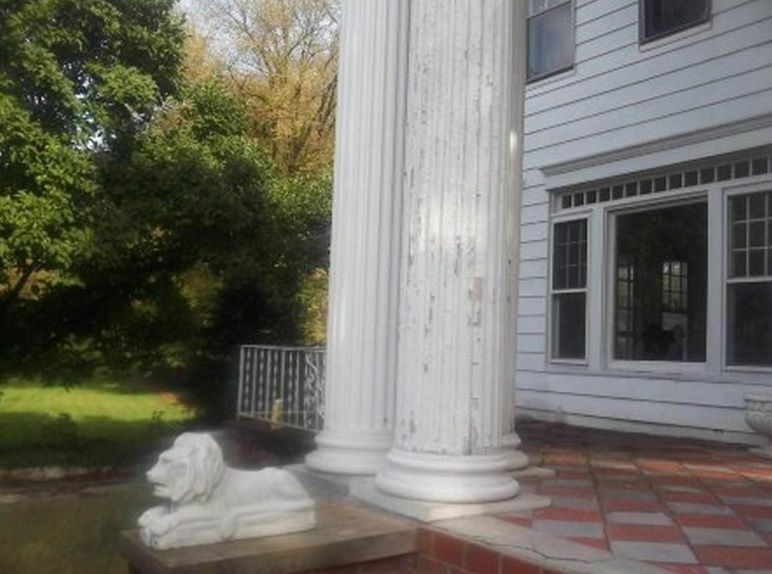 If I was queen of the world (and it shouldn’t be long now), I’d insist that the potential buyers of this rare, historically significant home be required to do a proper, thoughtful and historically sensitive restoration (which is radically different from a remodeling). 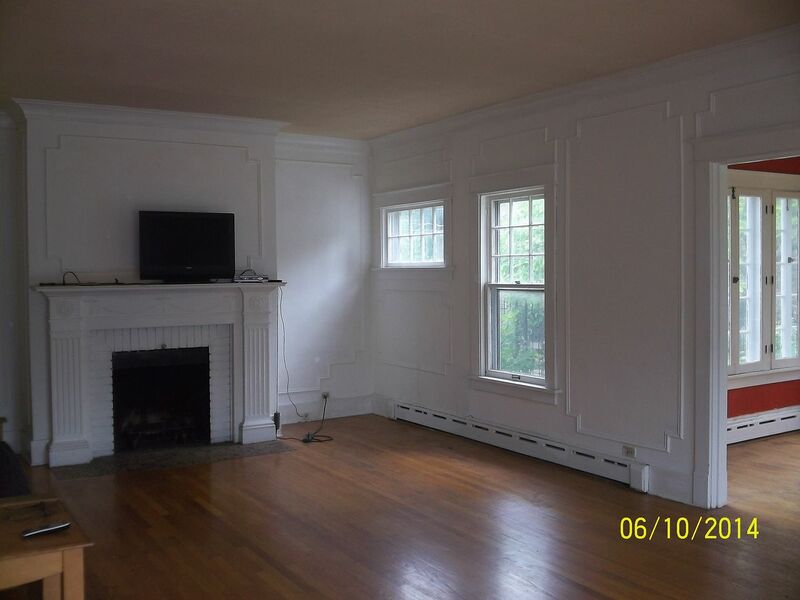 I’d demand that they find a way to preserve the home’s original features. The 3,895-square foot home is listed at $320,000. 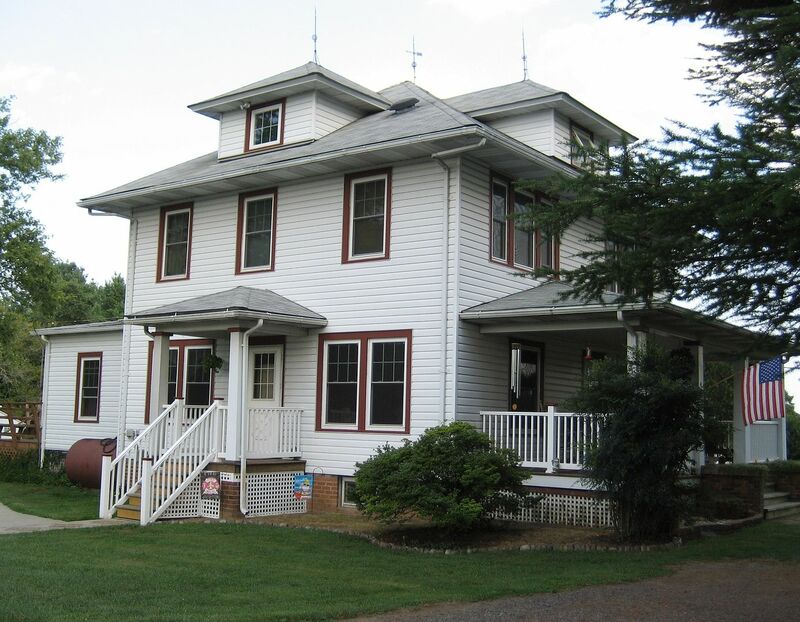 Situated on 1/3 of an acre, it has four bedrooms, three full bathrooms and two half-baths. 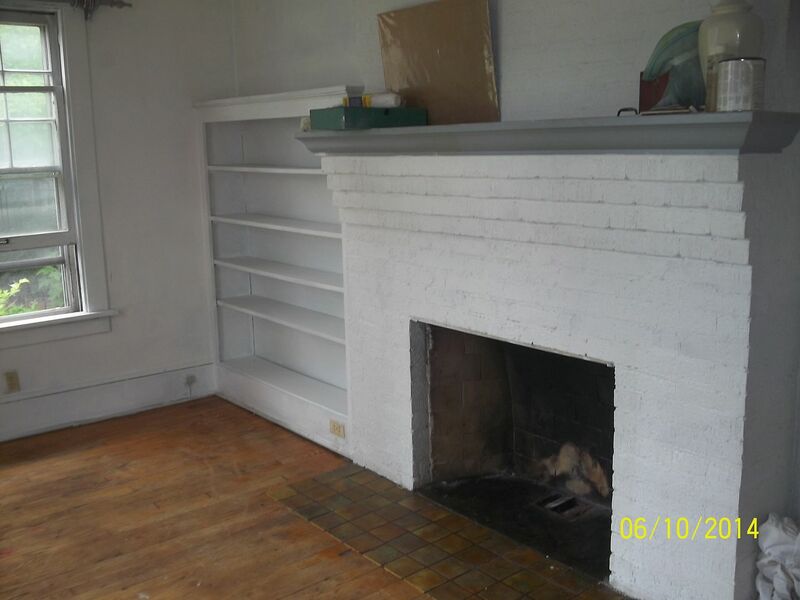 The listing says it was built in 1927, but we know that that’s not right. The Magnolia was offered from 1918-1922. This house is a rare treasure. 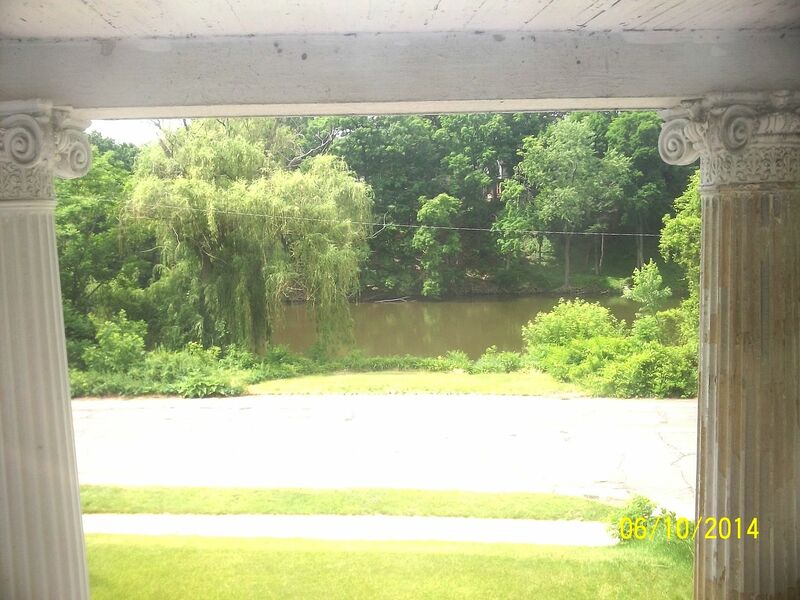 I hope its next owners “catch” the vision and see what a remarkable property it really is. Ready to see some photos? You should get ready to be dazzled! 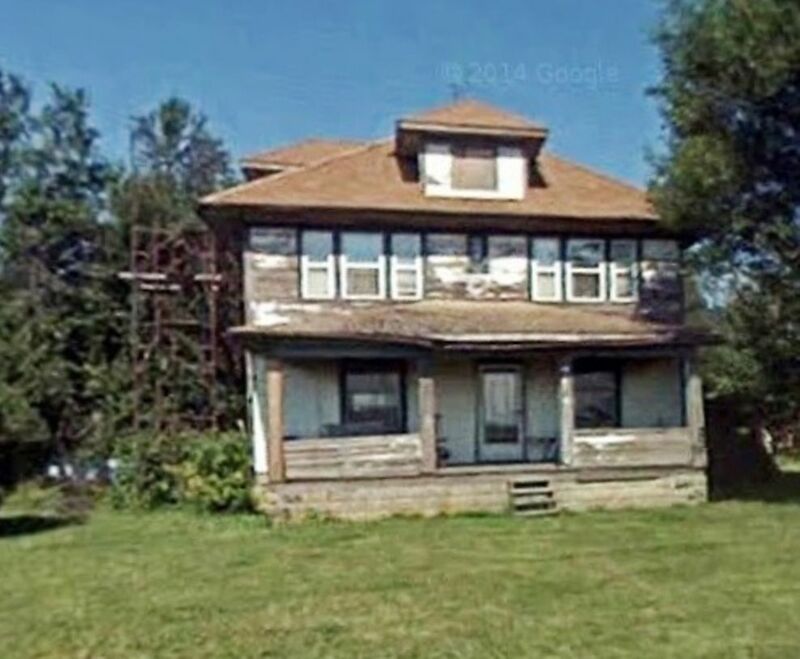 To buy this fine old house, click here. 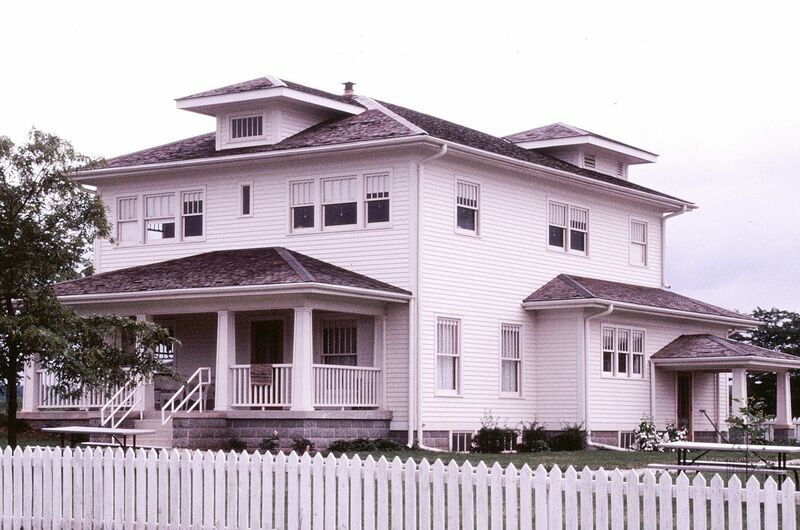 To learn more about the history of the Sears Magnolia kit home, click here. Interested in reading more about how these homes were built? Click here. All photos are copyright Steve Matz, 2014. The Sears Magnolia is now for sale in South Bend, IN. 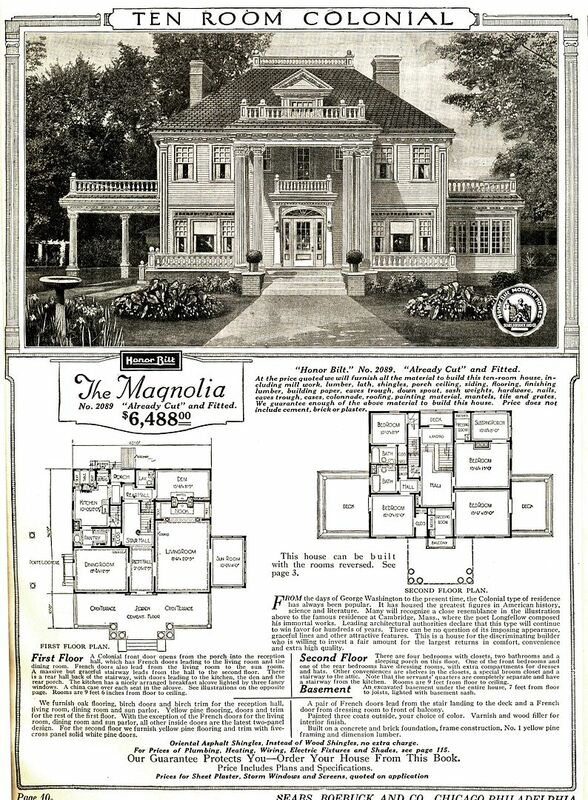 The Magnolia was offered from 1918-1922 in the Sears Modern Homes catalog. The Magnolia in South Bend is remarkable because it's in original condition. A view from the inside. This Magnolia still retains its original mouldings and trim but the inglenook and columns are not in place. 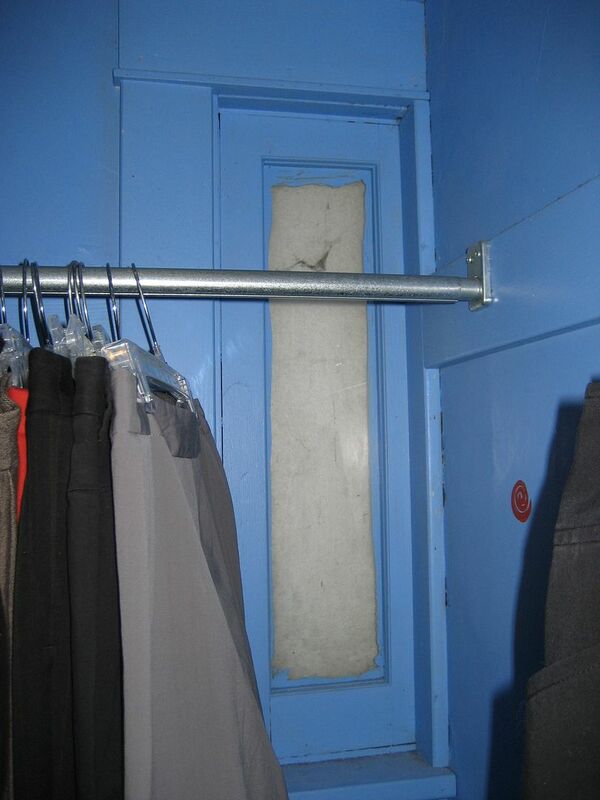 It's possible that the house was built without these built-ins. I suspect that this is the fireplace in the den. The den (right rear) was very small (only 8'9" deep). It's unusual to see the den in its original shape and size. 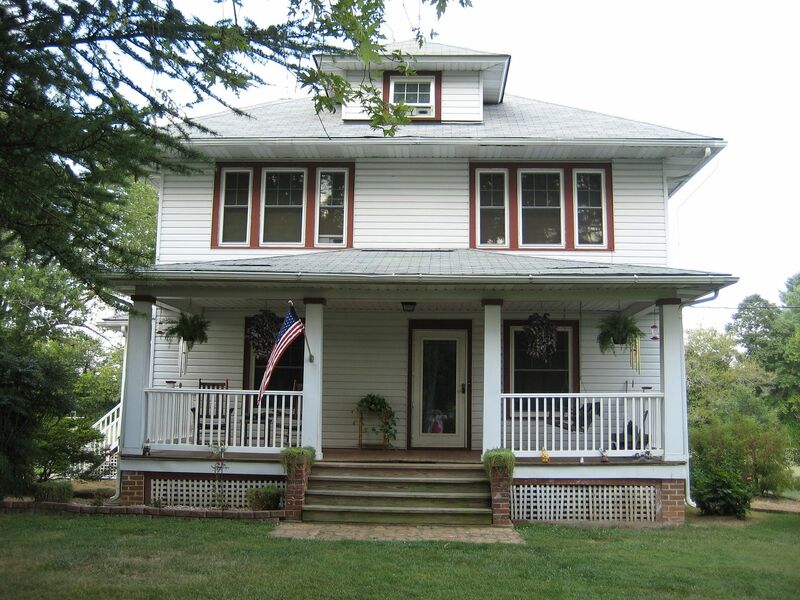 It's also unusual to see a house from this vintage with a half-bath on the first floor (next to the den). 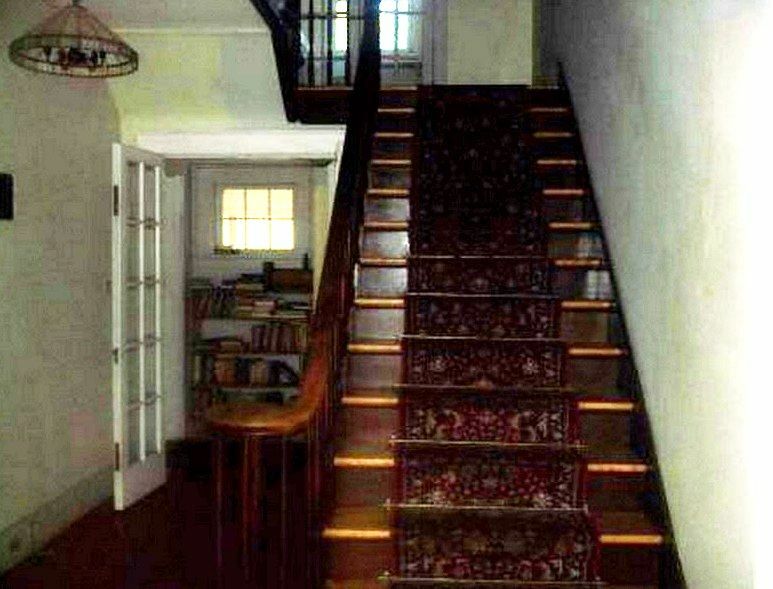 The Realtor had the good sense to photograph the staircase from the same angle as the original catalog image! Nice match, isn't it? 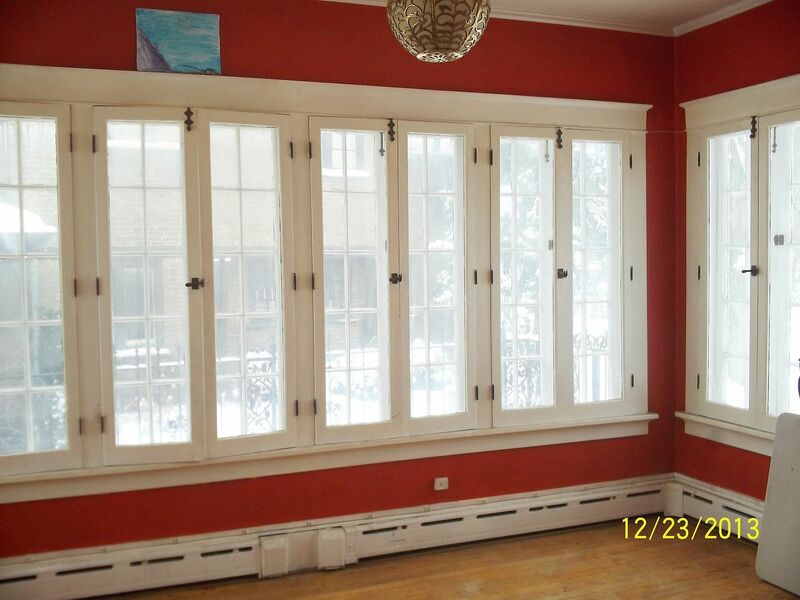 Check out the French doors at the rear - both upper and lower level. There's something about these old nooks that just makes my heart skip a beat. This is the very best picture of all. 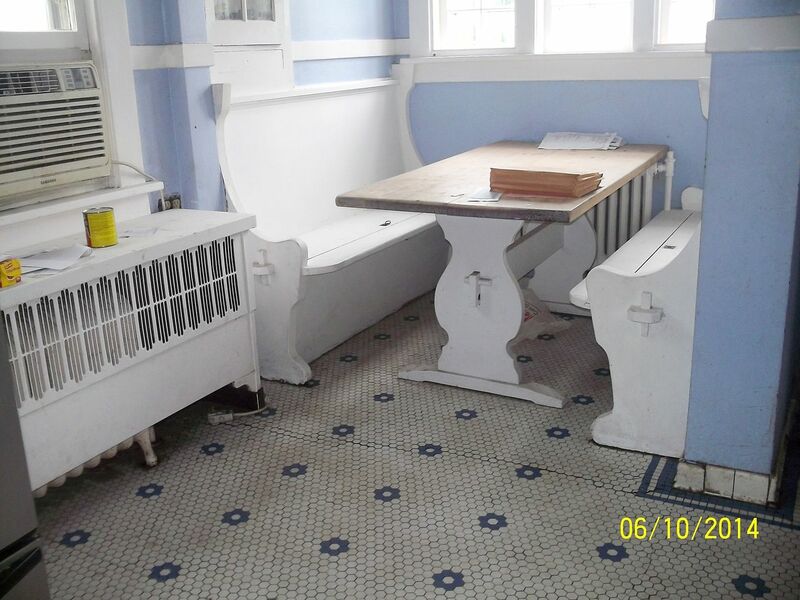 And perhaps the home's finest feature: A built-in nook, completely untouched by time, with the original tile floor, white hexagonal tiles with a blue flower center. 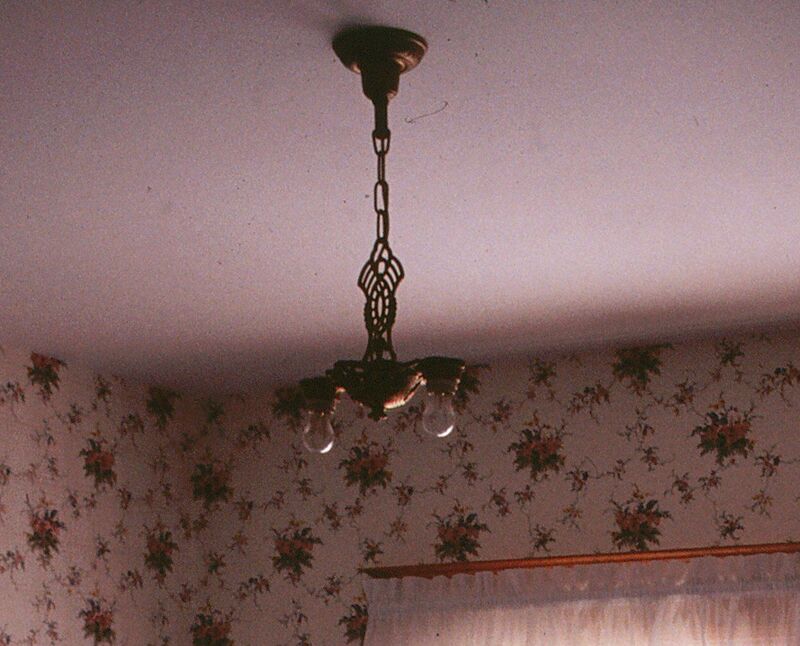 This pattern is a classic feature found in early 20th Century Sears Homes. You can see the three original wooden windows behind the nook. Fun comparison, isn't it? It's so rare to see these nooks still in place. 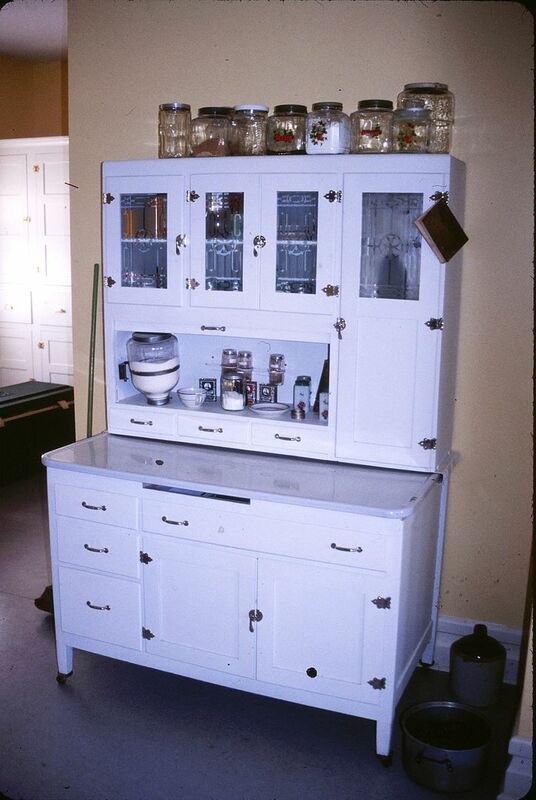 Not only does this house have its original Butler's Pantry, but it has the original sink, wooden surround and fixture. 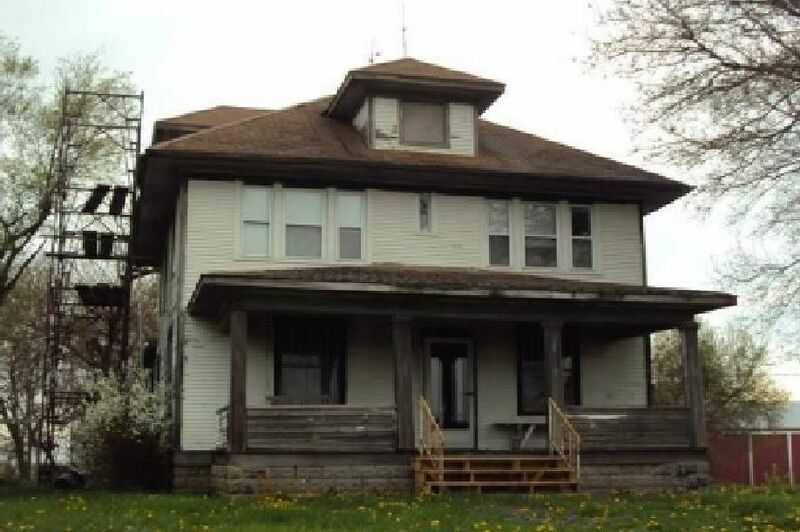 This house is such a rare find, and to think that it's a Sears Magnolia! Upstairs, just off the Master Bedroom, is a surprisingly large dressing room. The fact that even the dressing room is original is a real testament to the home's prior owners, who had the wisdom to follow the #1 rule: "Thou shalt not destroy good old work." And this cabinetry was incredibly good work. 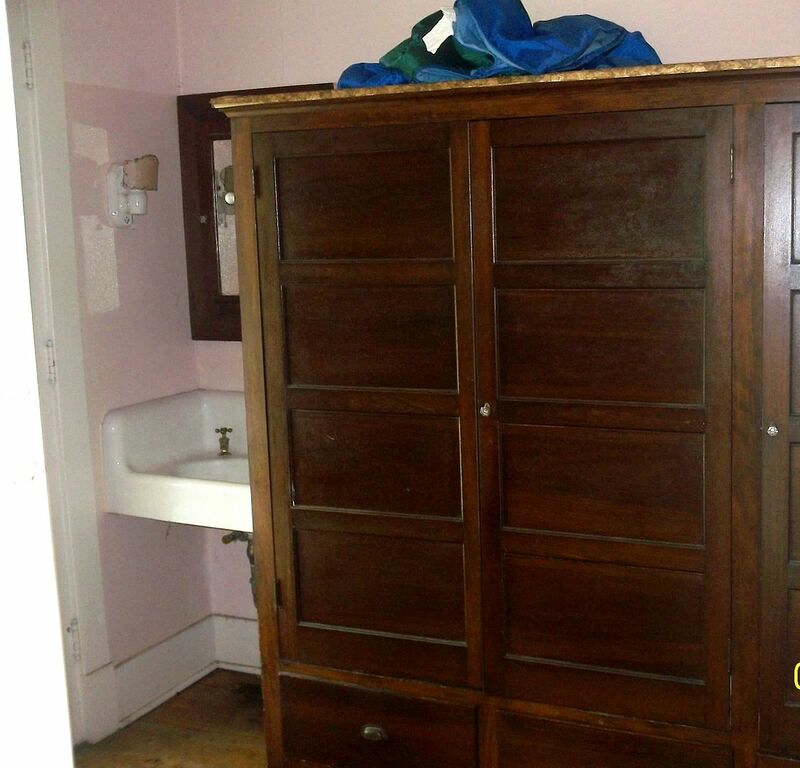 In the corner, is the Magnolia's original sink, light fixtures and medicine chest - unpainted! 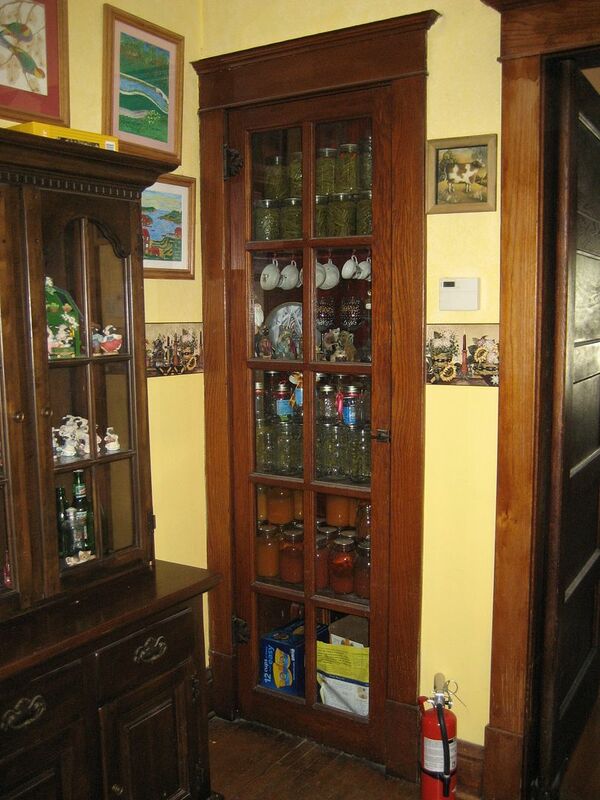 If you look closely, you'll see the original cabinet pulls. It's true that I am nutty as a fruitcake, but seeing this century-old Magnolia - wholly untouched by time - sends me. 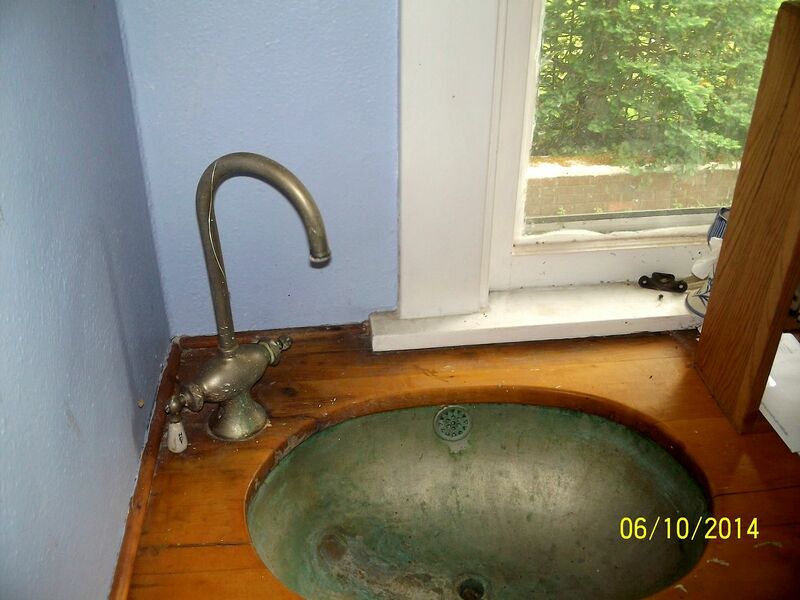 Original sink, original fixtures, original medicine chest, and an original light fixture (porcelain sconce). Just incredible. 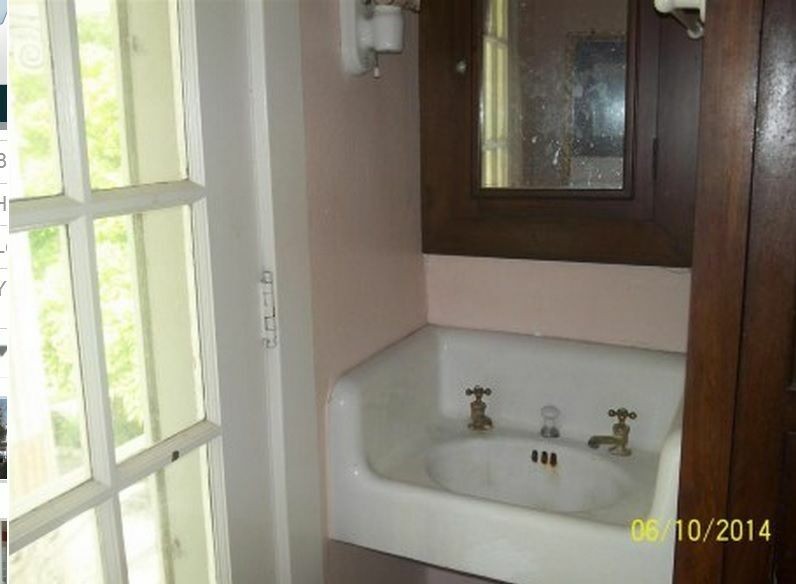 I'm a big fan of old plumbing but I've never seen a three-sided sink before. 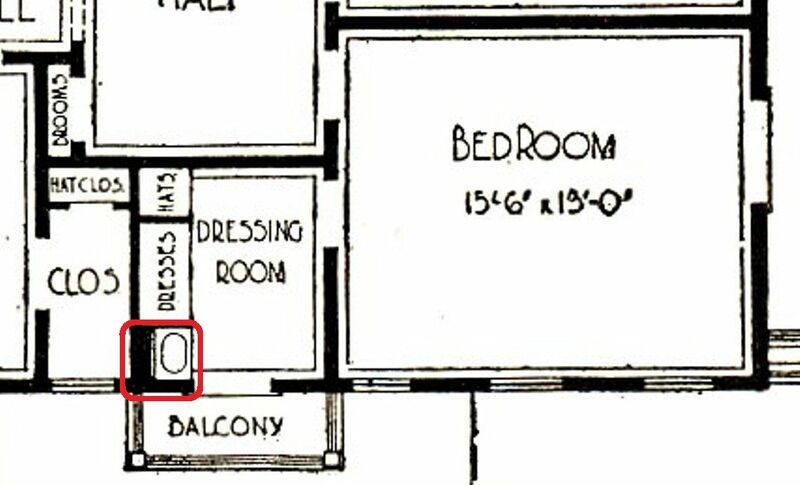 Close-up of the upstairs floorplan, showing that small sink in the dressing room. 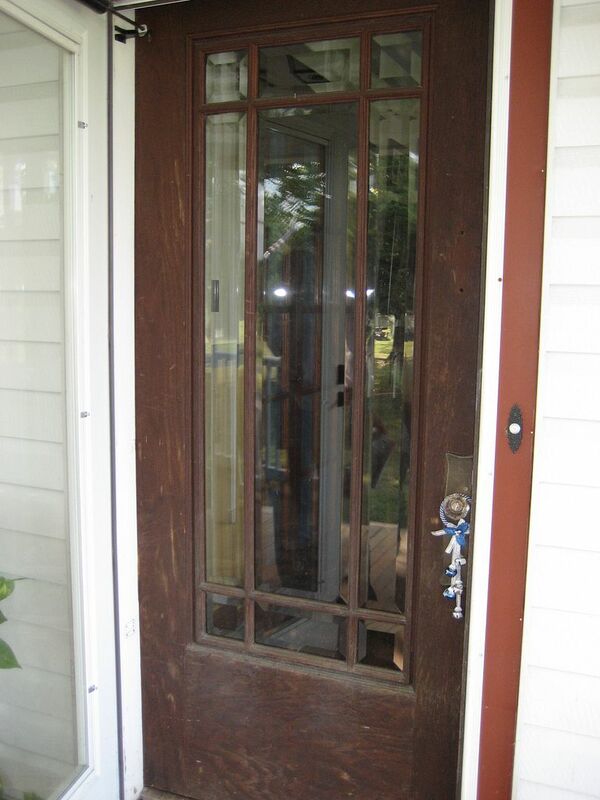 And the sunporch has its original wooden casement windows. A view from the upstairs 2nd floor balcony. Interested in learning more about the Sears Magnolia? Click here.